wan life to live: "ronald reagan? the actor?" 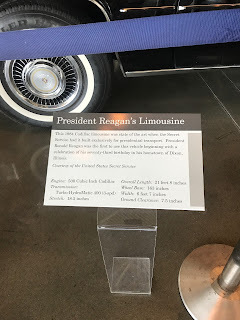 so i think ford was the president when i was born, and then i vaguely remember jimmy carter's term as i got a little older. 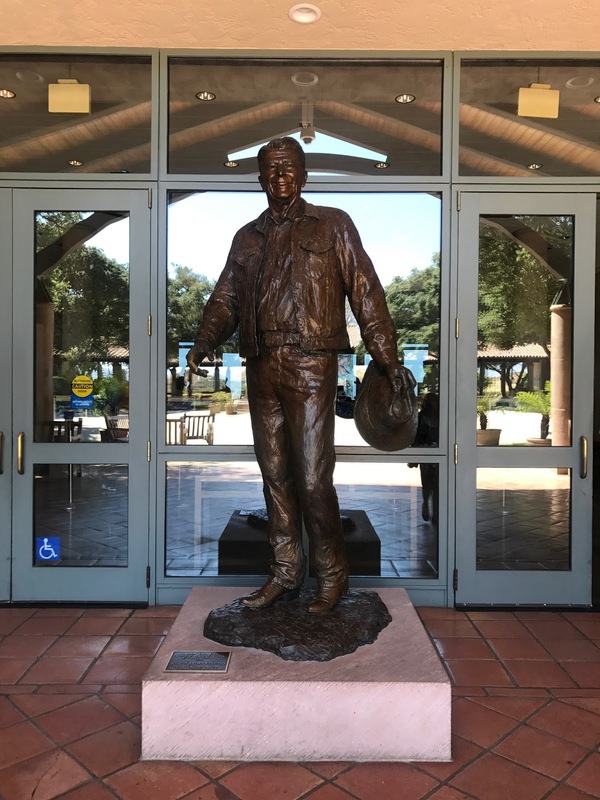 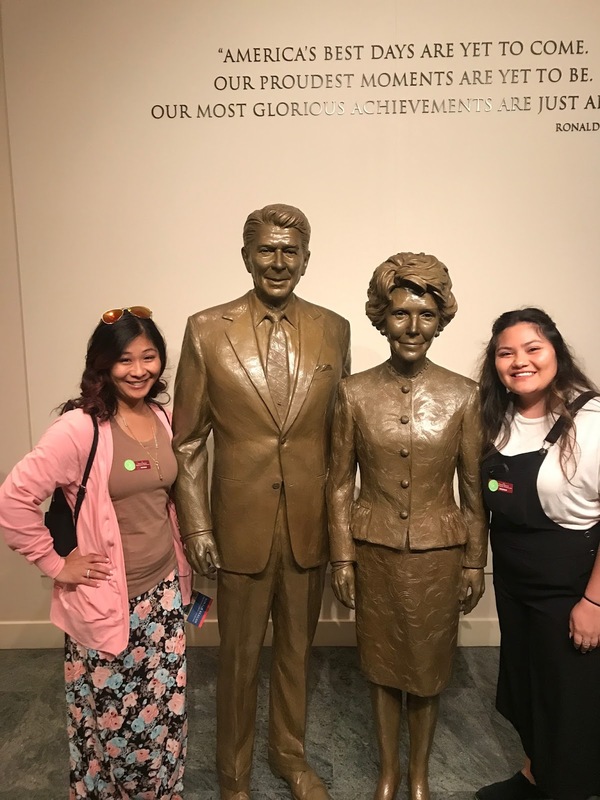 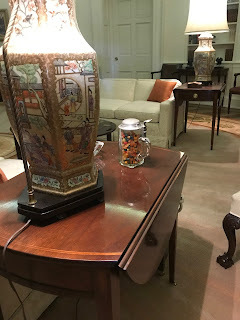 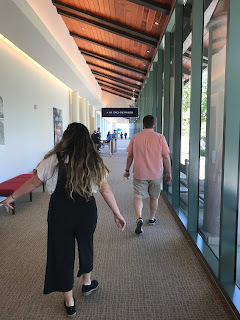 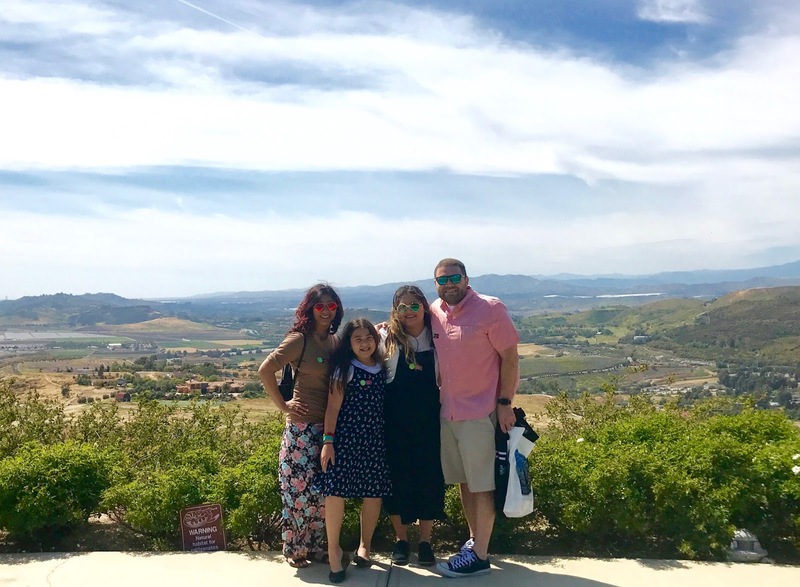 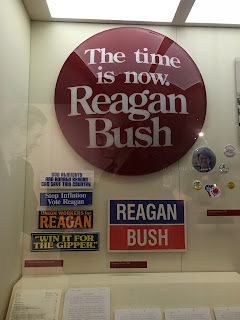 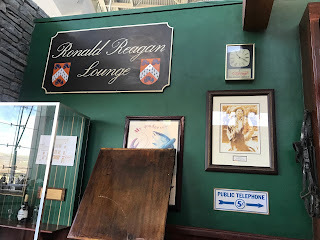 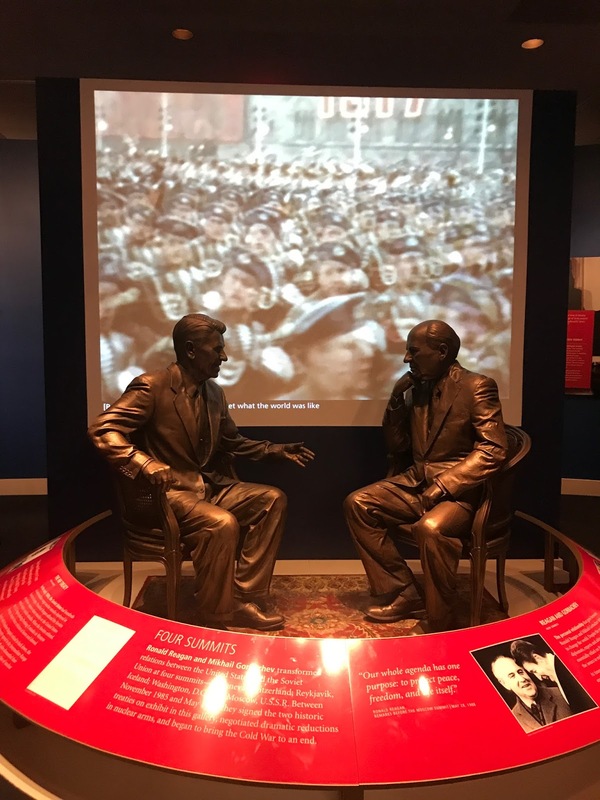 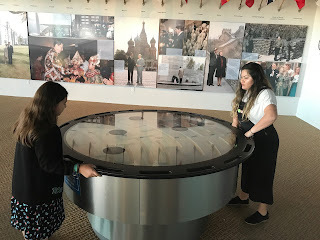 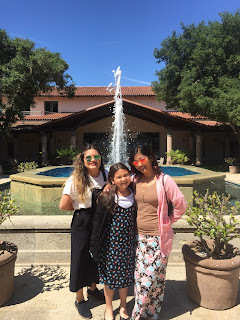 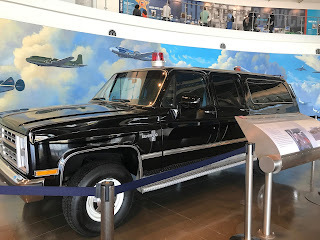 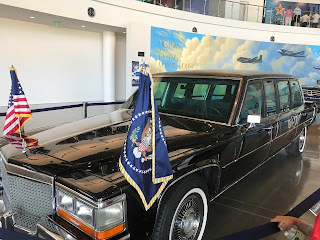 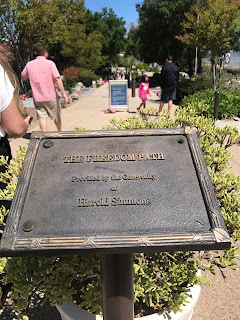 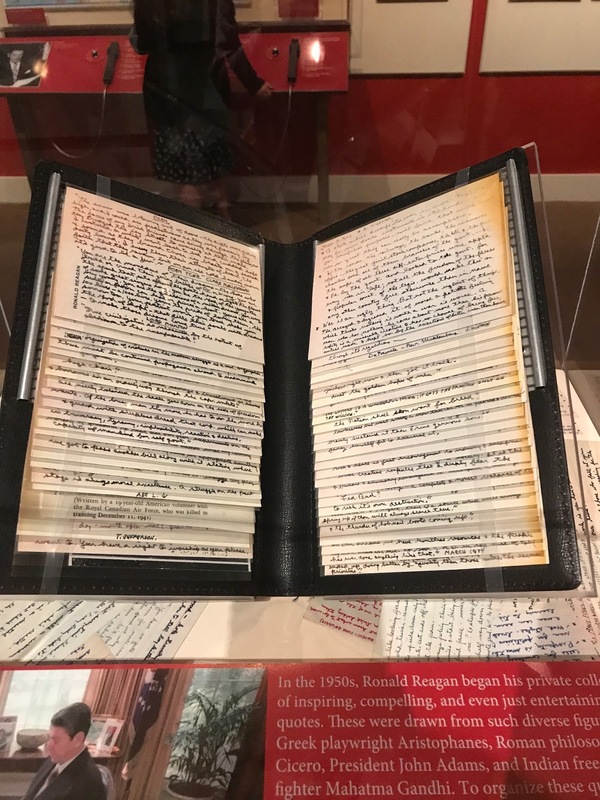 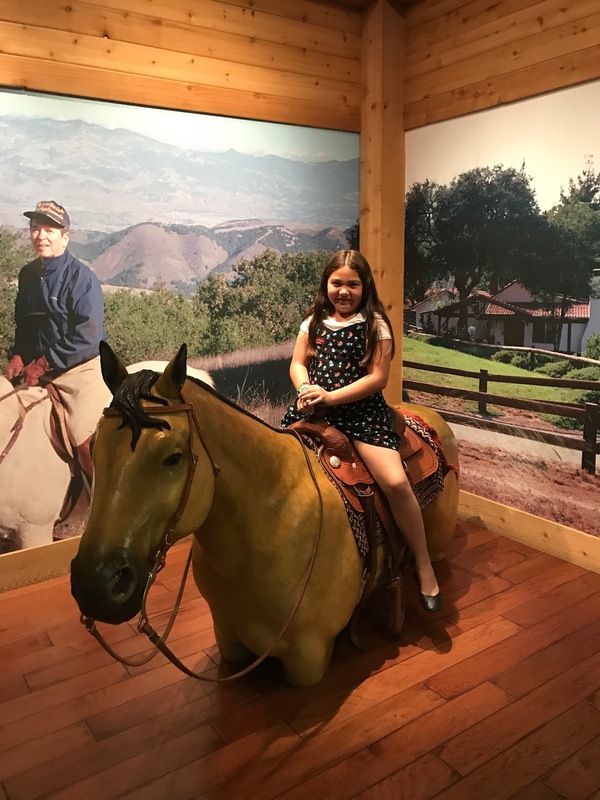 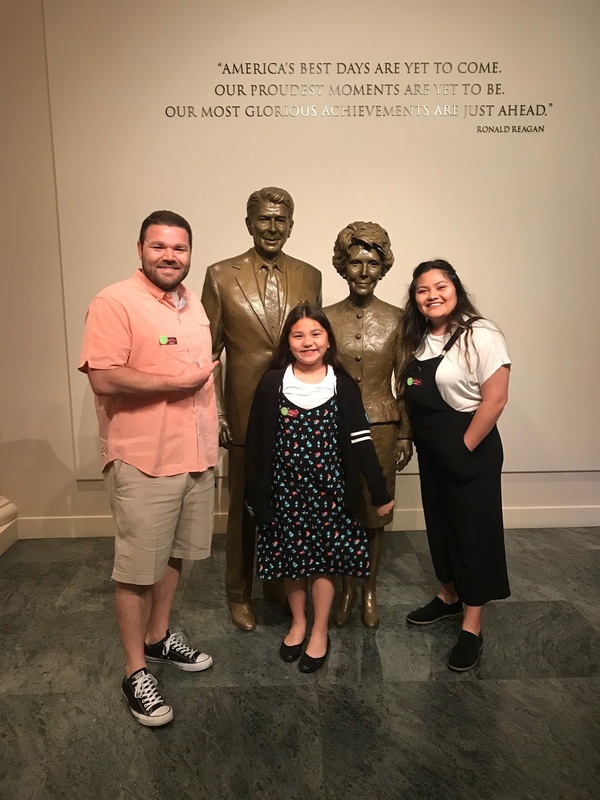 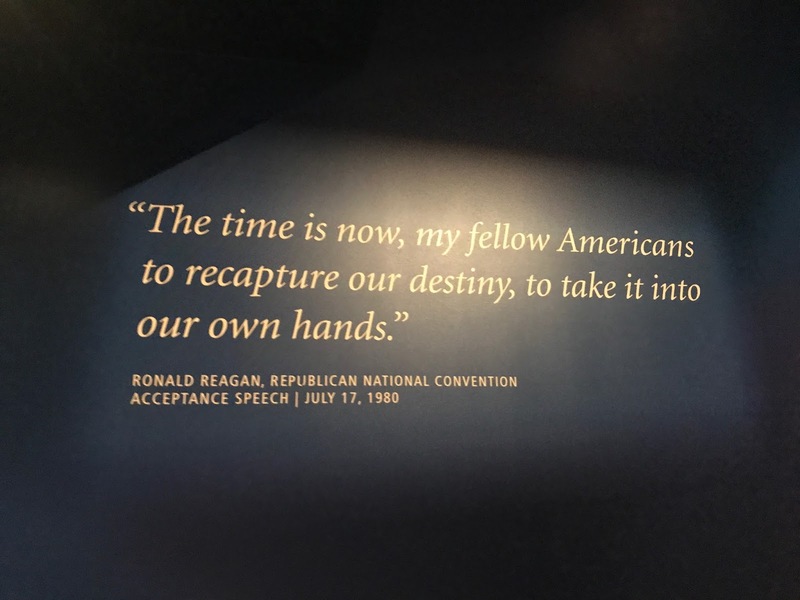 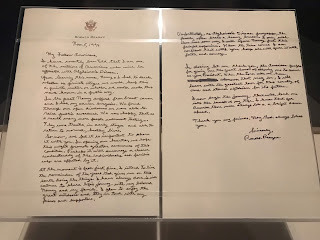 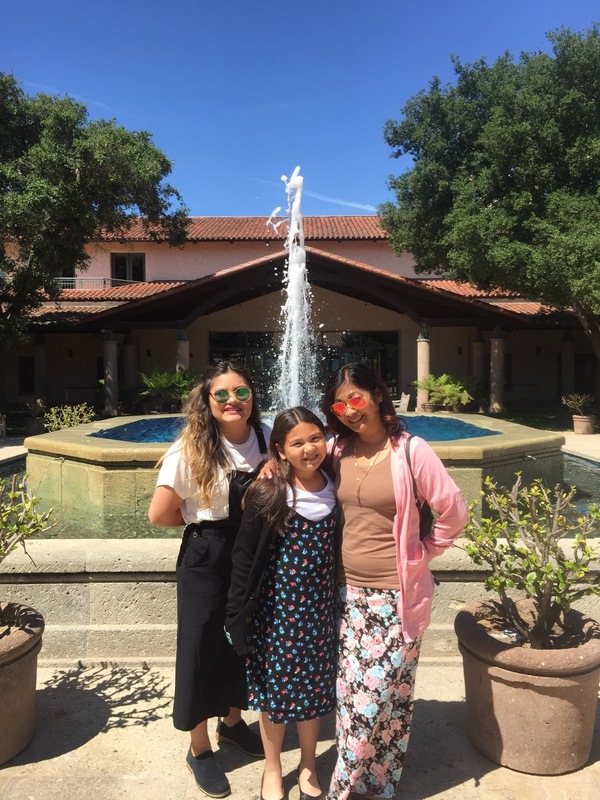 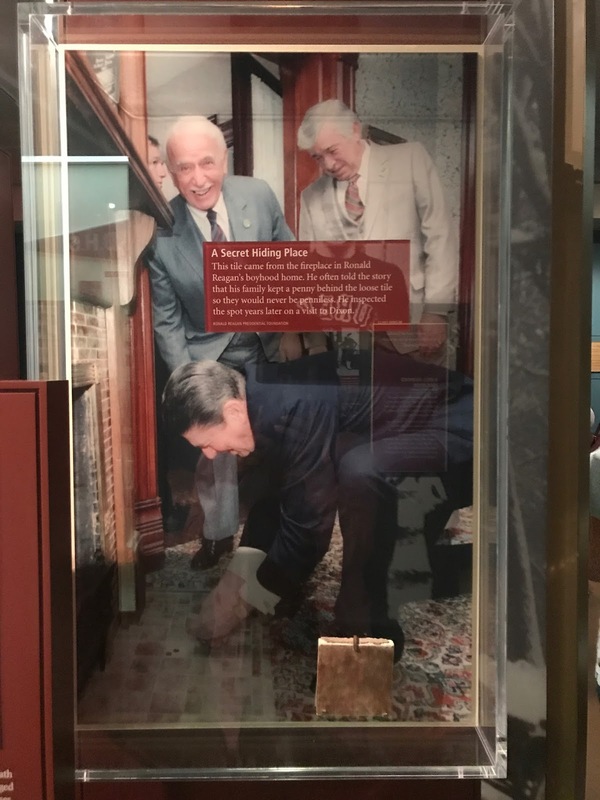 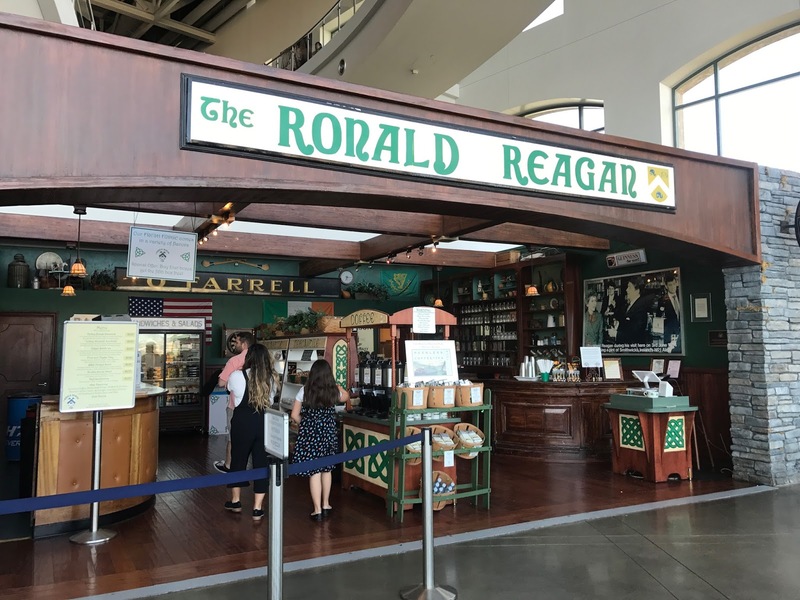 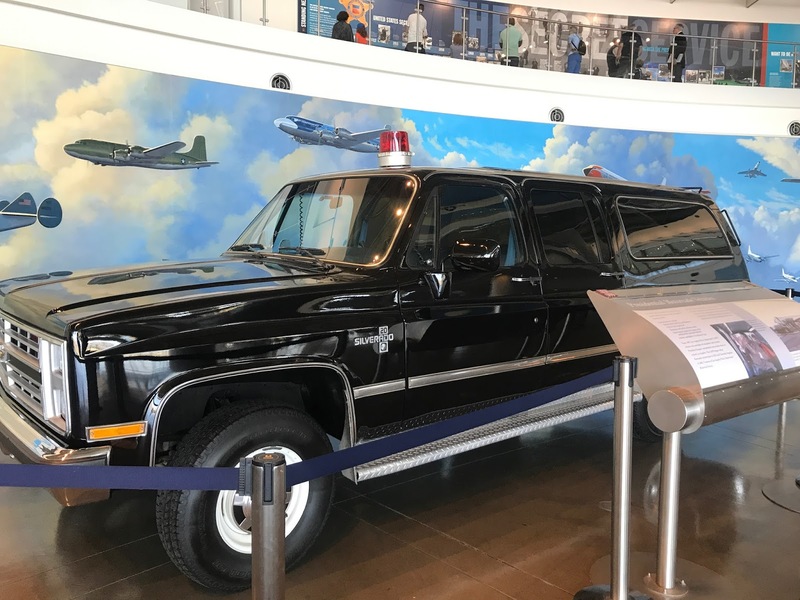 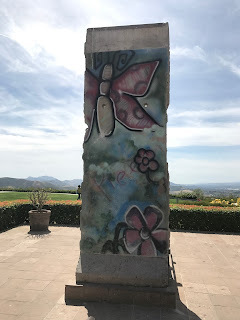 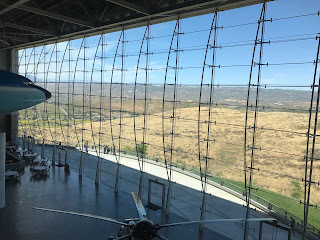 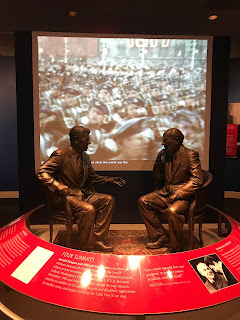 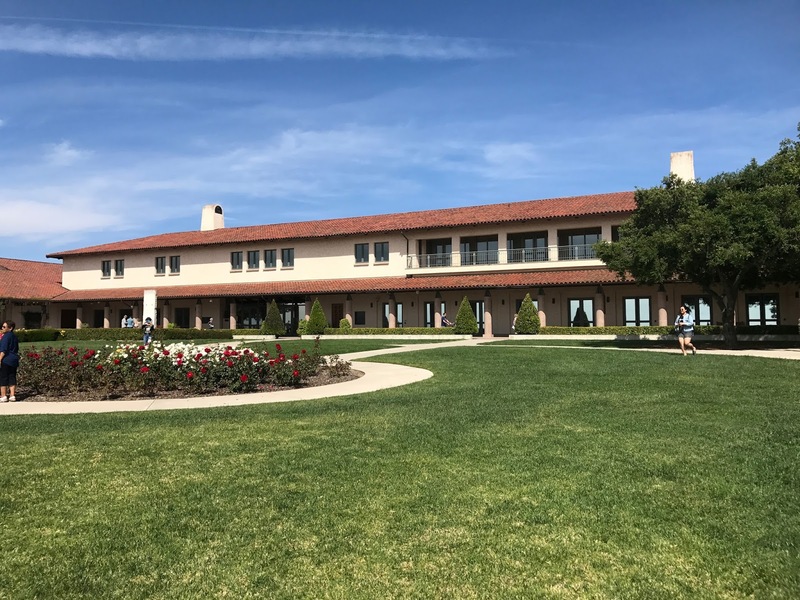 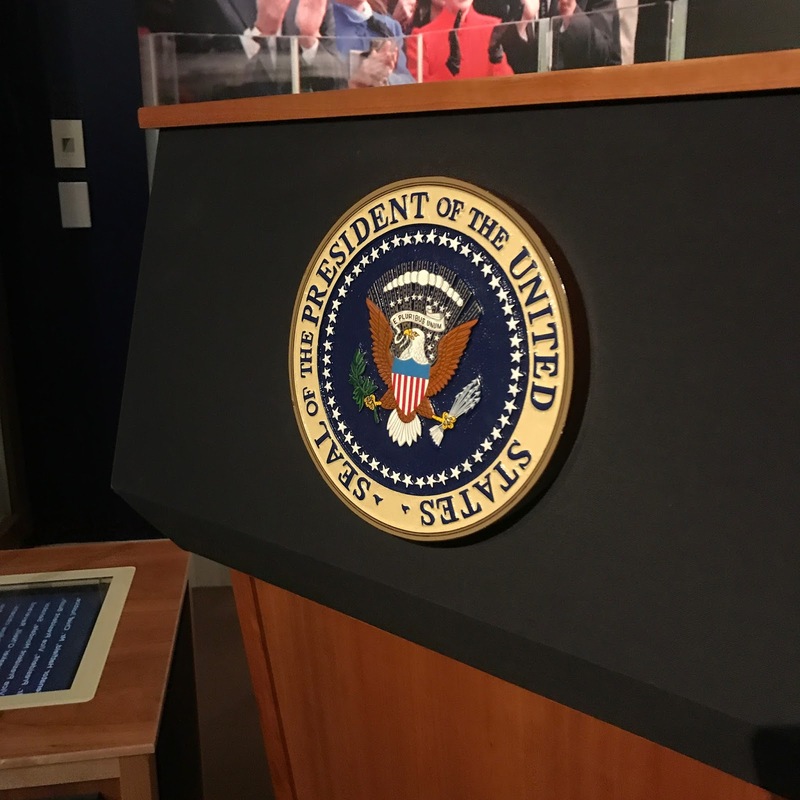 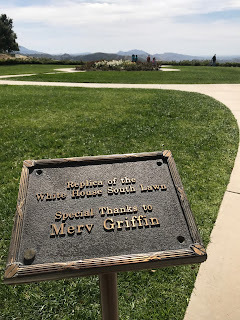 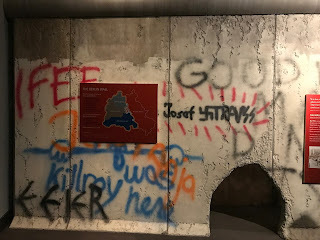 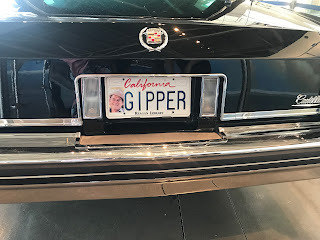 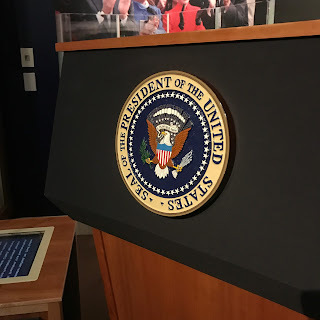 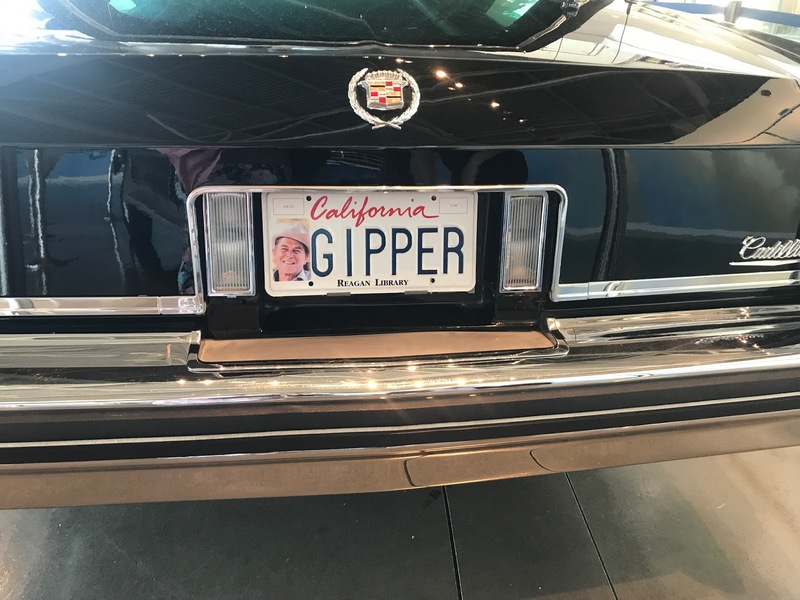 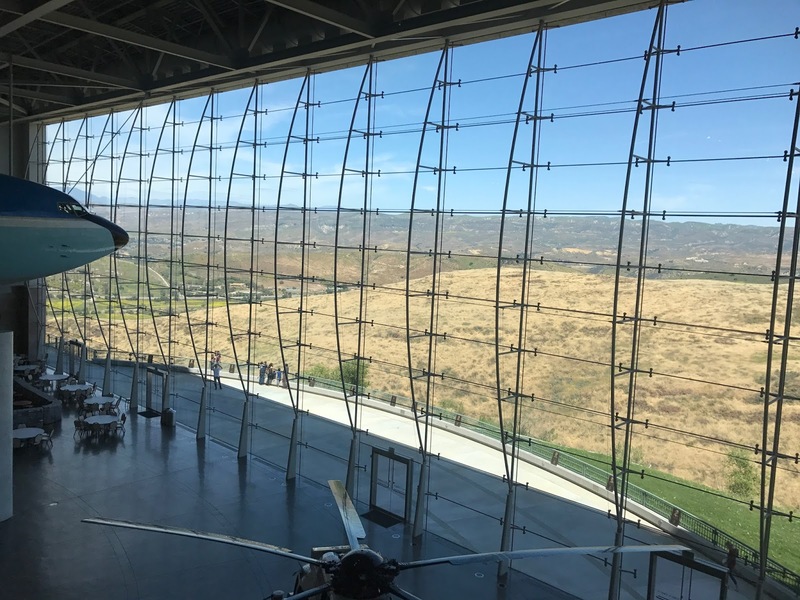 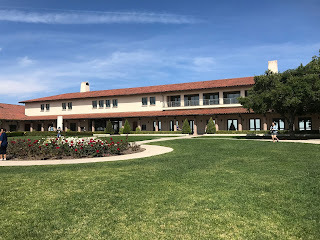 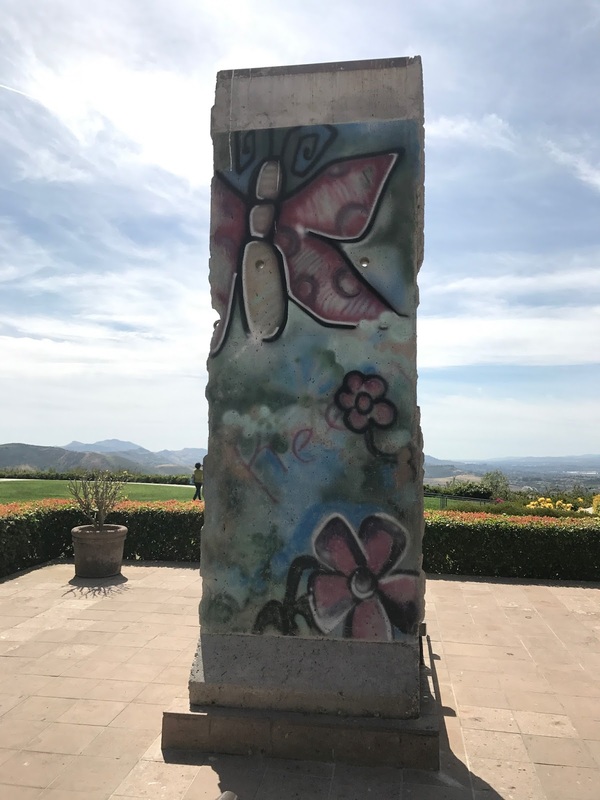 but it was ronald reagan who i remember most as i was growing up, and visiting his presidential library in simi valley has been on my list for quite a while. it seems that people either loved him or hated him with not much gray area in between, and while i definitely didn't understand a lot of the political stuff back then i always thought of him as my favorite president. you know me, i'm all about the sappy nostalgia. 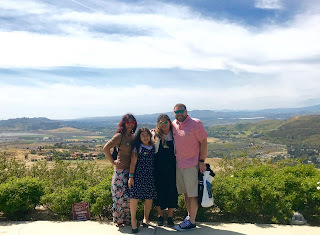 while we were trying to decide what to do for easter, i came across a groupon that would have gotten us in for half the regular cost. too bad that it had an expiration date that was several weeks before easter, and we would have had to pay the difference when we got there. 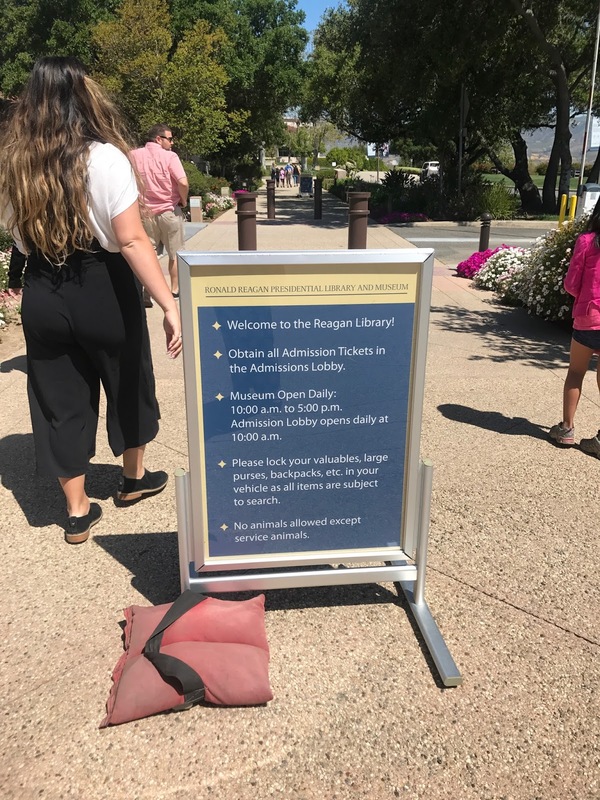 so i sucked it up and bought our tickets online at full price instead. 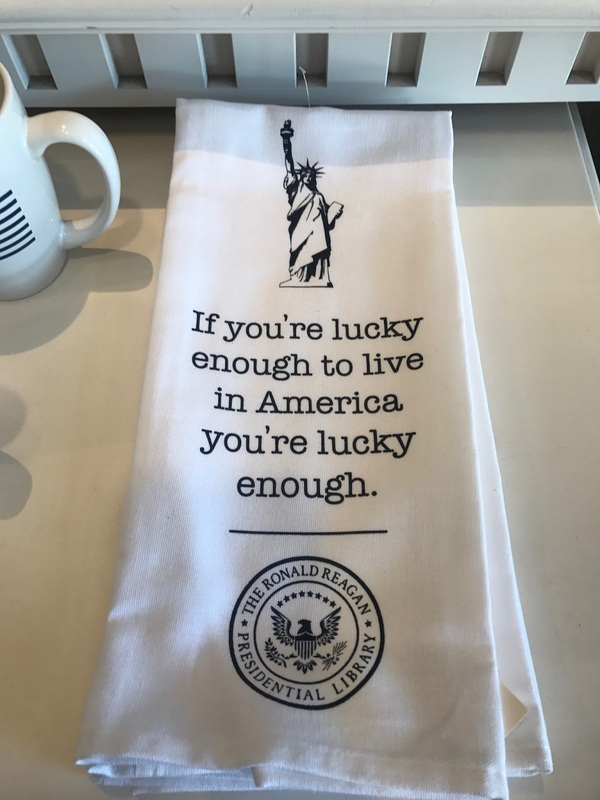 boo. 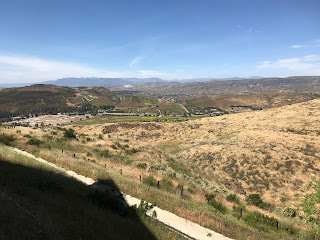 we lucked out with a gorgeous clear day, with a bit of a breeze and temperatures in the 70s. perfect. 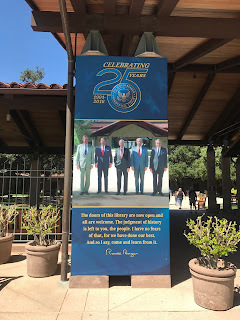 i didn't realize that it had been here for so long - they're celebrating their 25th anniversary. 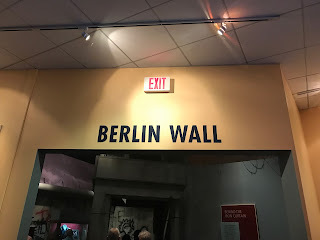 i showed you this shot before, but i mainly took it because of the name on the wall that the bean just happened to sit next to. 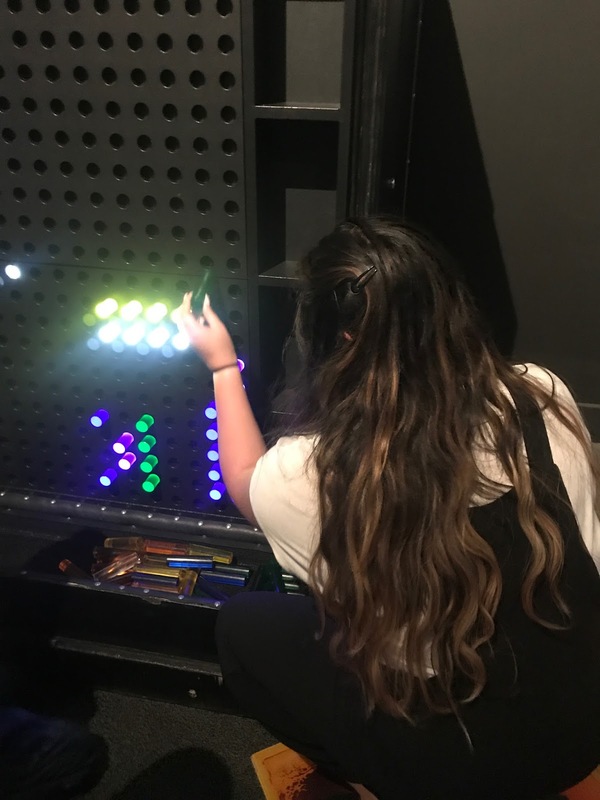 she thought that was pretty cool. 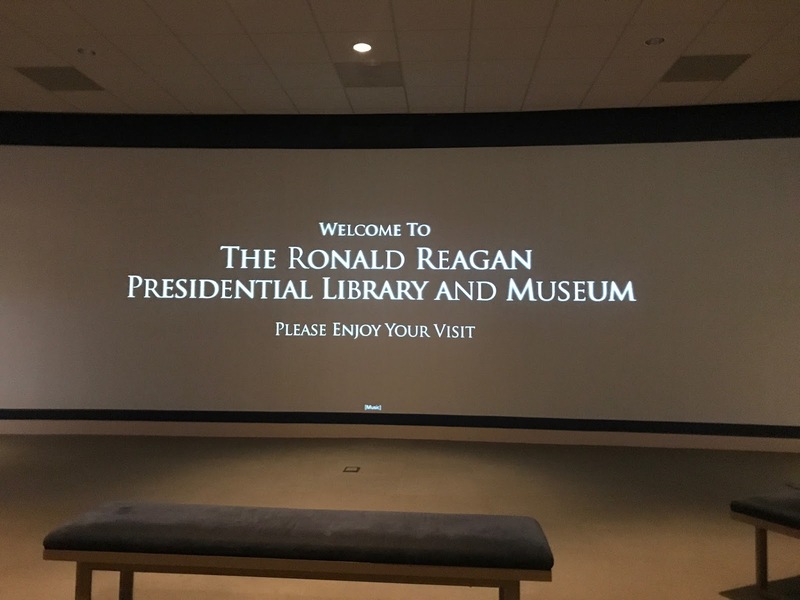 and we sat down to watch a 3-minute video that gave us an overview of who ronald reagan was and what he did for our country. the first gallery briefly went over his very early years - family, hometown, education. 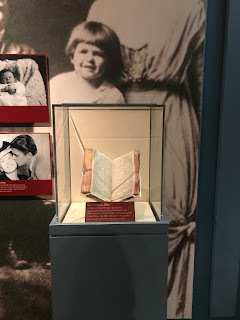 this was his mother's bible and the one he placed his hand on during both of his inauguration ceremonies. 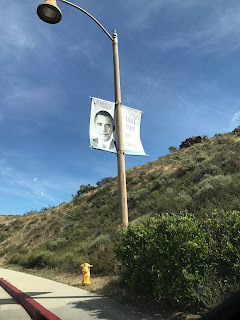 the old lady said "wow, he was kinda hot!" 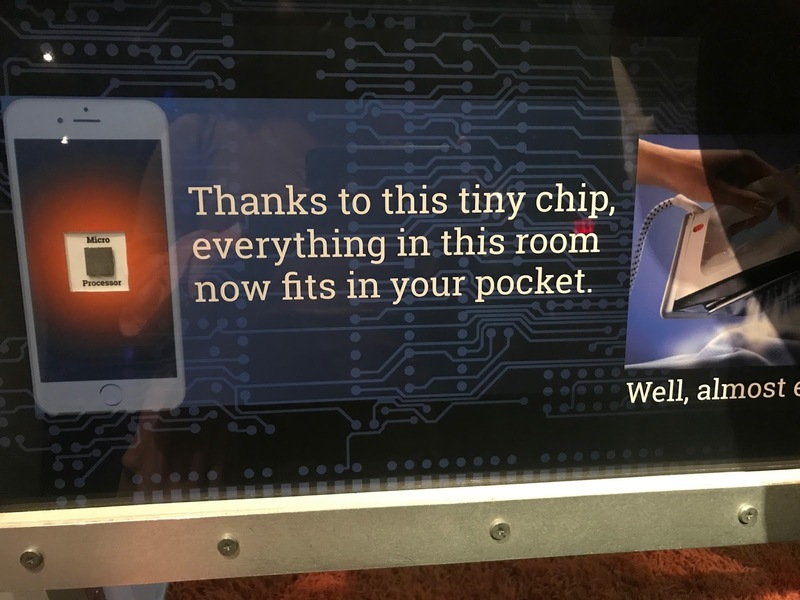 heh. 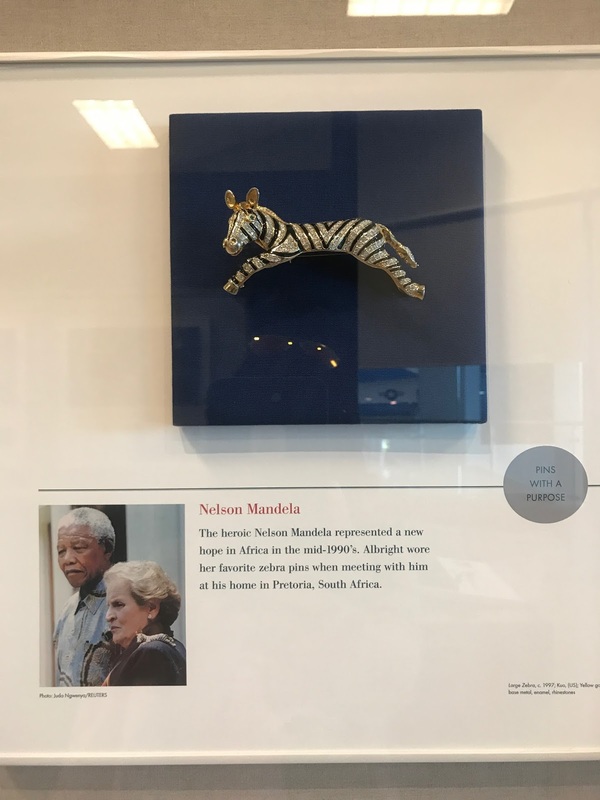 this was a piece of tile from his childhood home. 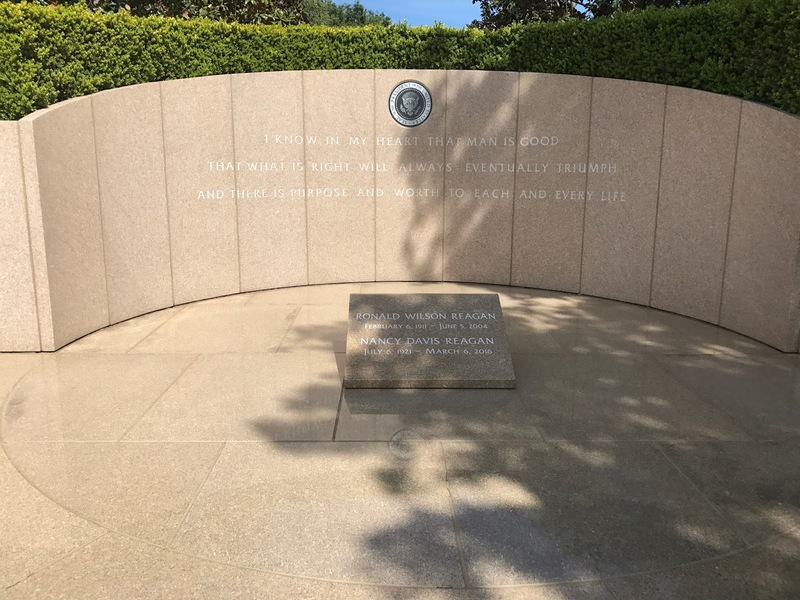 the story goes that his family hid a penny underneath it, so that they would never be penniless. 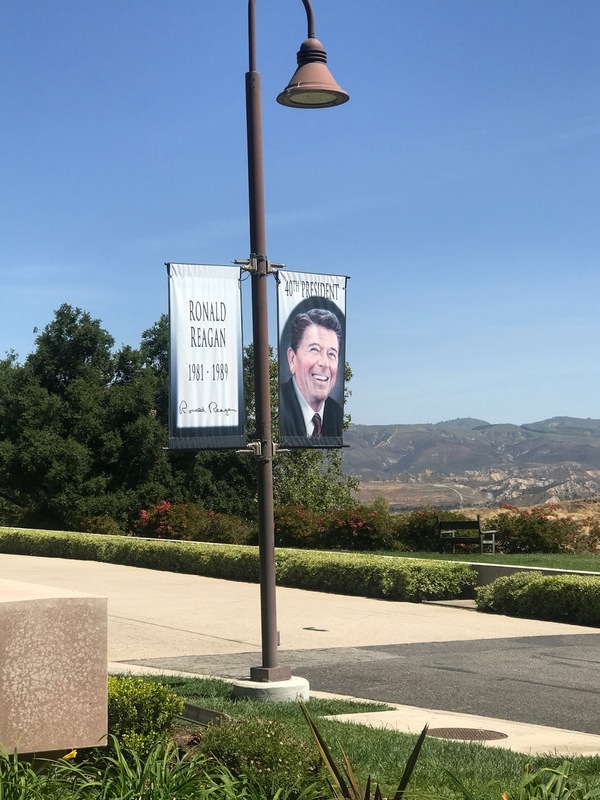 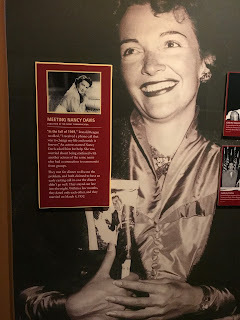 there was also a gallery all about mrs. reagan. 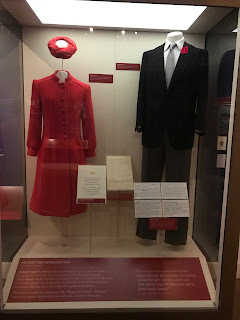 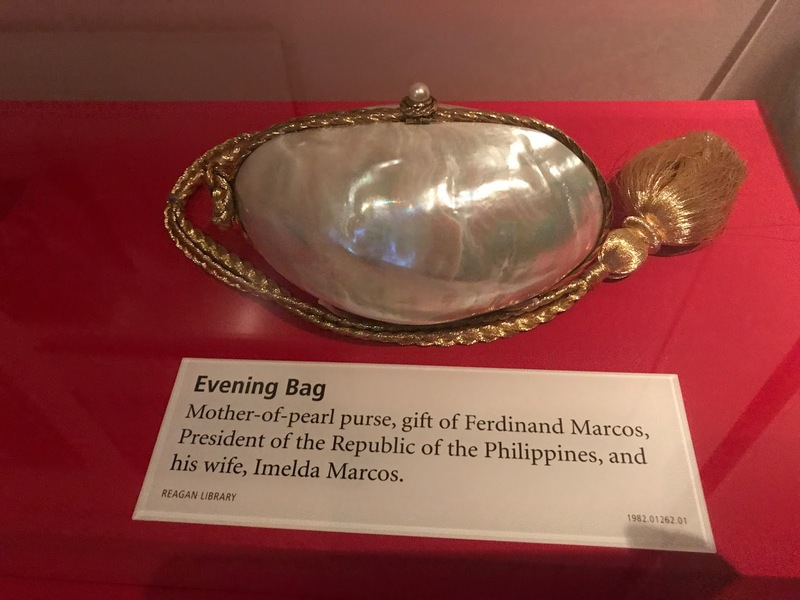 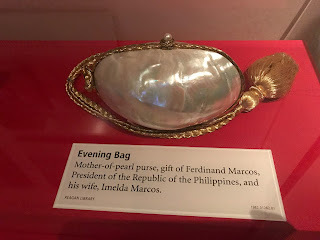 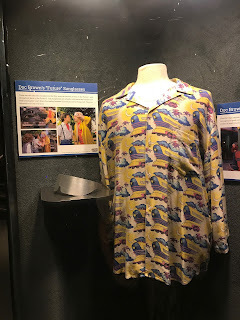 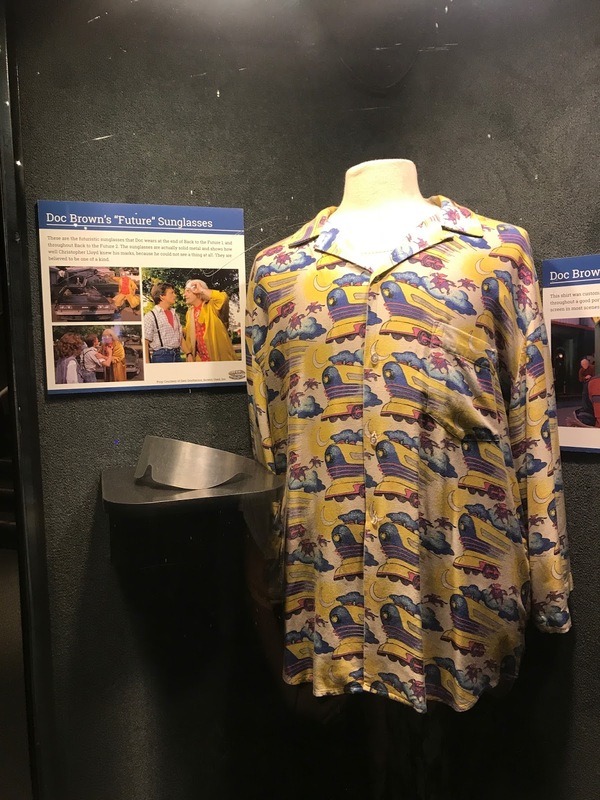 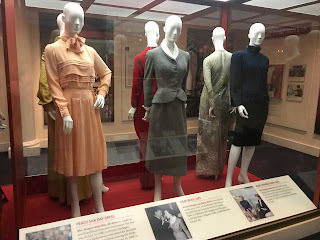 we learned a little bit about her life, how and when they met, gifts she received as well some of her wardrobe when she was the first lady. we learned about his time as governor of california and looked at some of his handwritten notes that he kept during those terms. 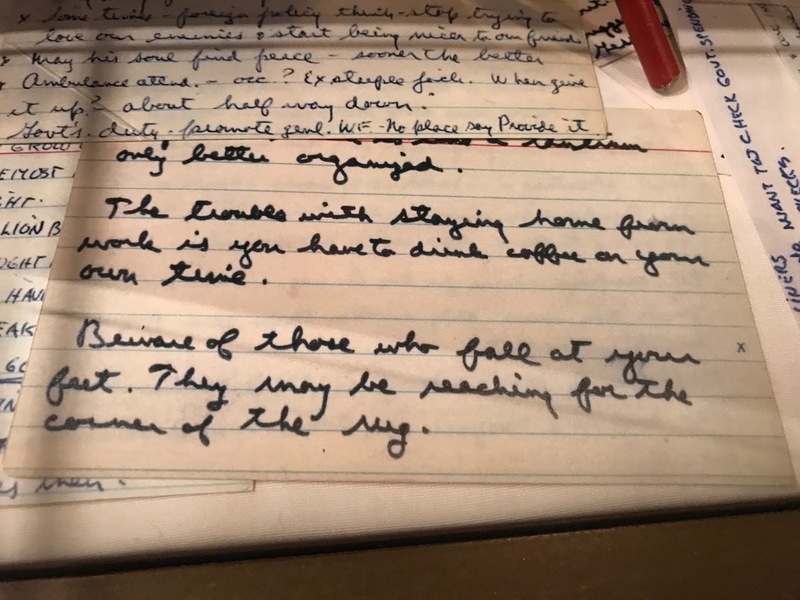 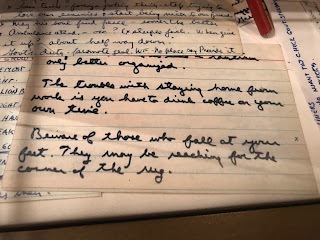 he liked to incorporate letters he received from children into his speeches and kept a really organized journal of index cards with notes and one-liners and quotes he liked. 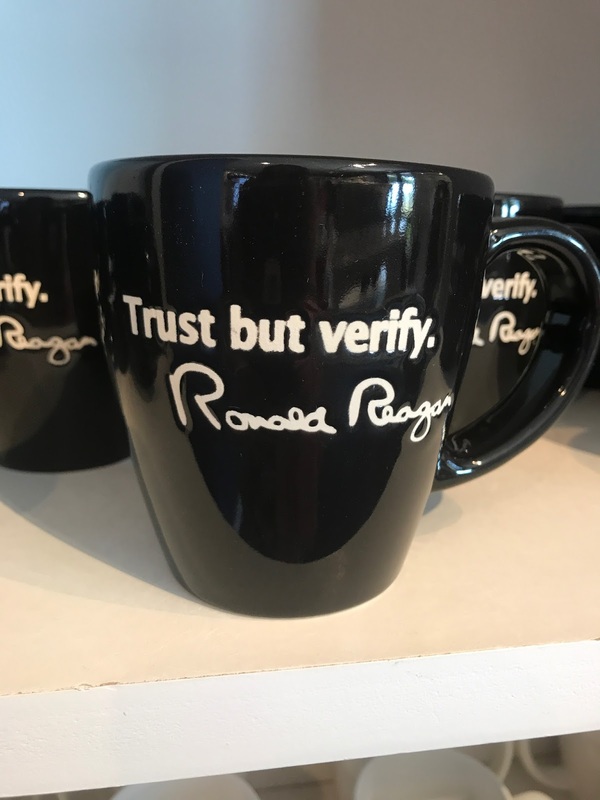 there was lots of memorabilia from his election campaigns. 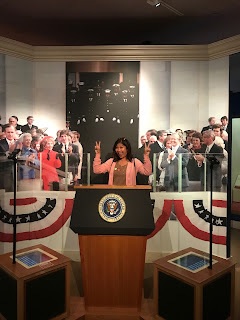 and you know i had to take advantage of this photo op. 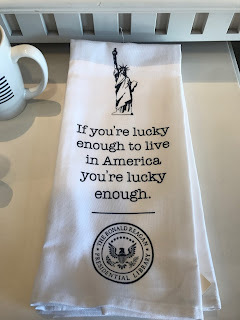 i mean, duh. 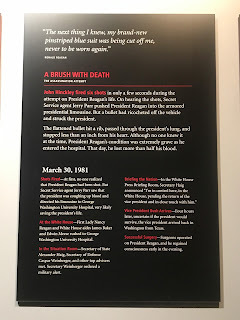 and of course, a section dedicated to the attempted assassination. i didn't realize that this had happened so early in his presidency - just 70 days into his first term. 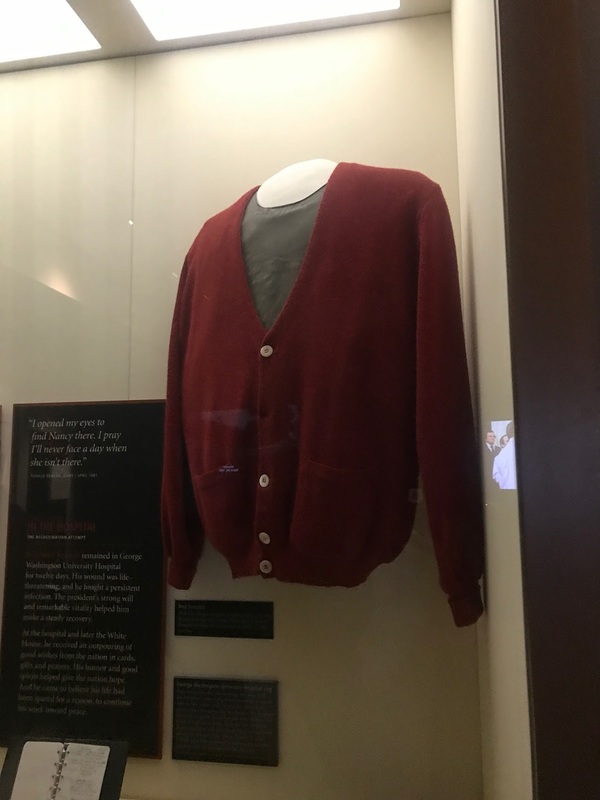 there were photographs and footage before, during and right after the shots rang out, a video that recreated the tense first moments at the hospital, handwritten notes when he couldn't speak, and the sweater he wore when he was discharged. 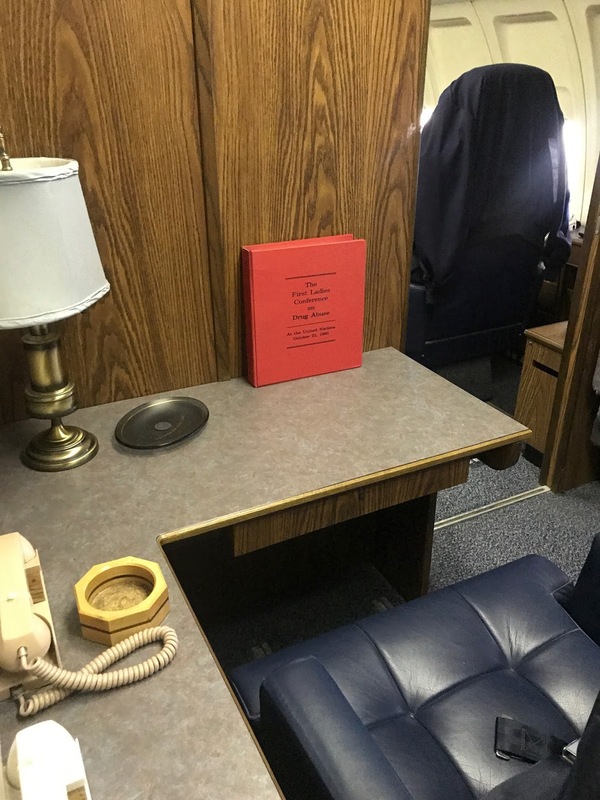 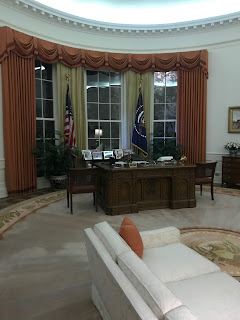 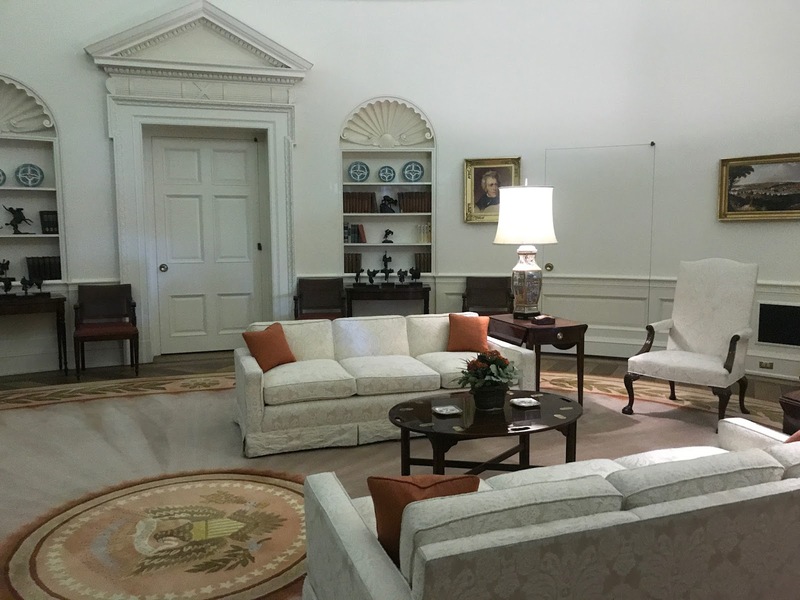 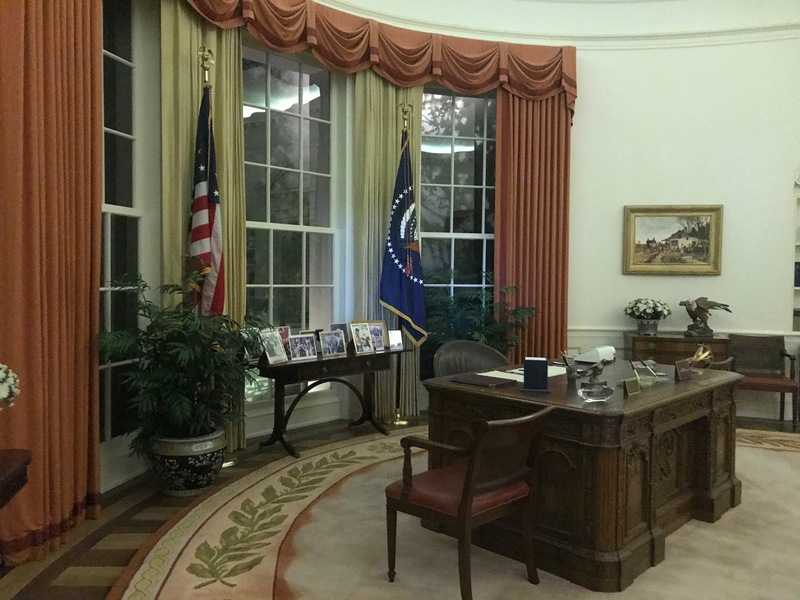 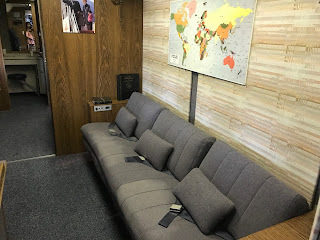 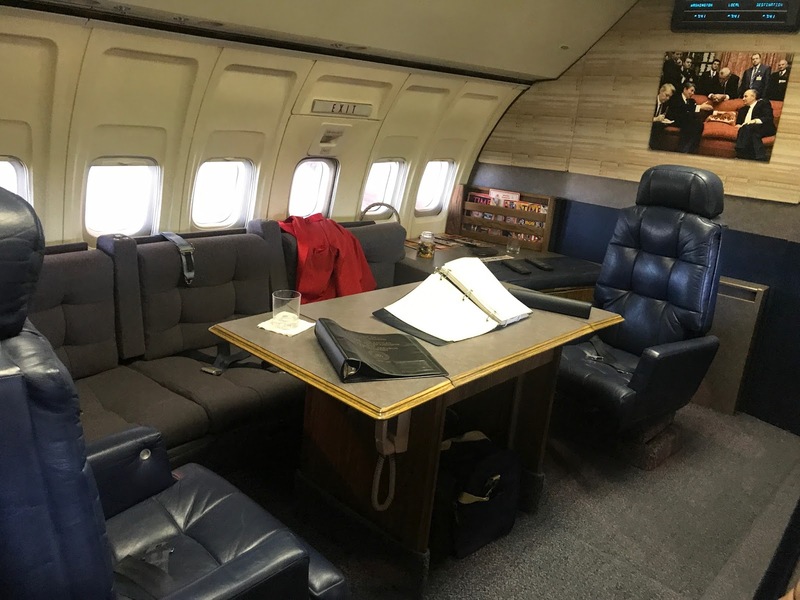 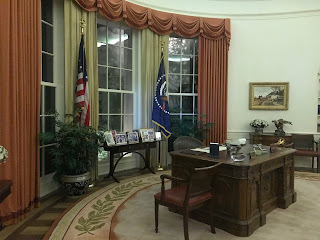 a full-scale reproduction of the oval office is here too, furnished exactly how it was while he was there. 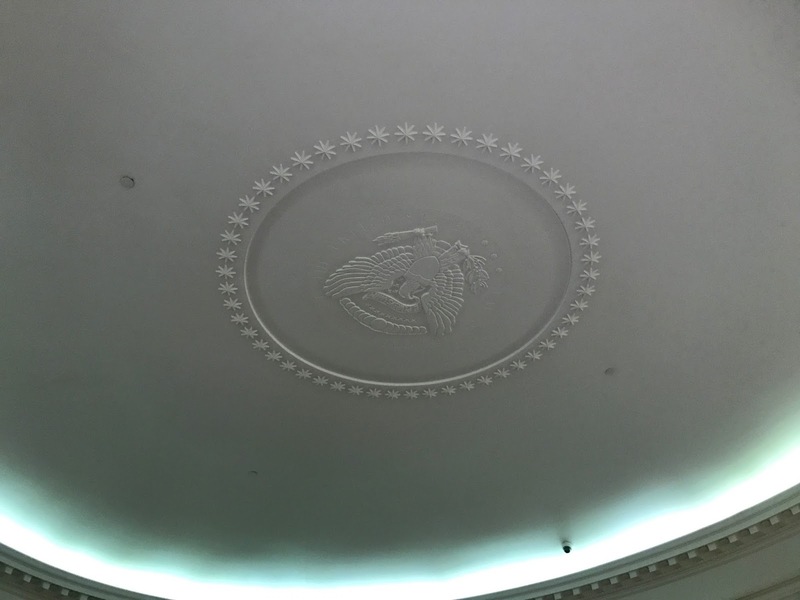 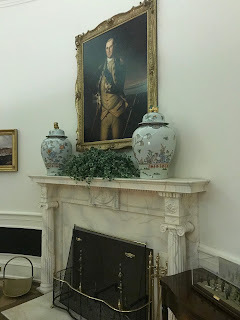 he was very involved with the construction of it, and even had the builders dig a little deeper and add stairs to ensure that the ceiling was the same height as that in the white house. it was pretty cool. 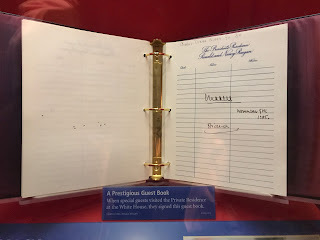 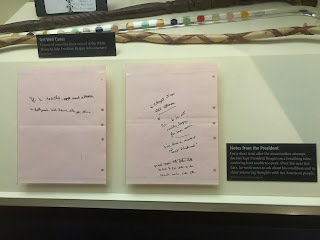 the white house visitor's log with princess diana's signature in it. 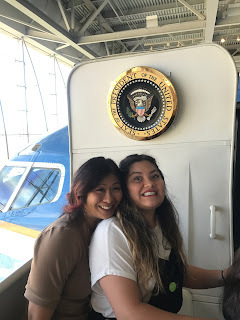 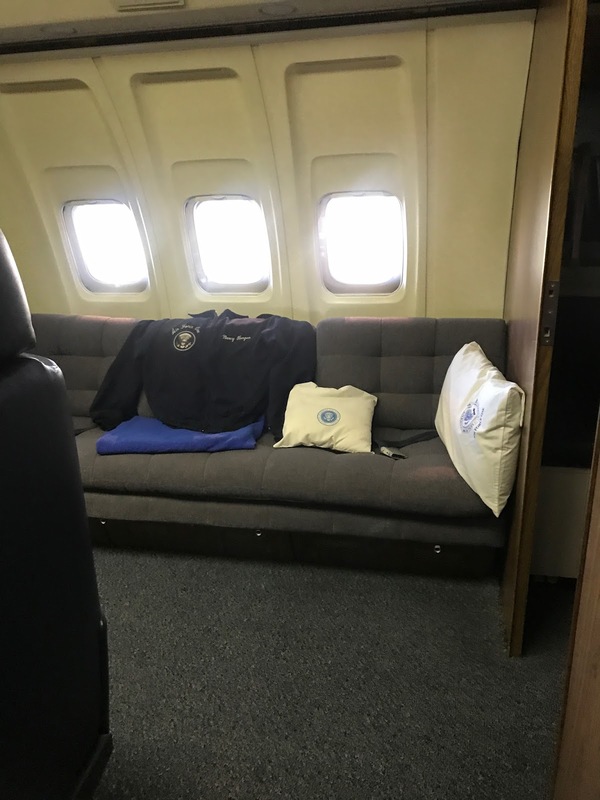 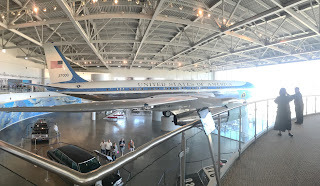 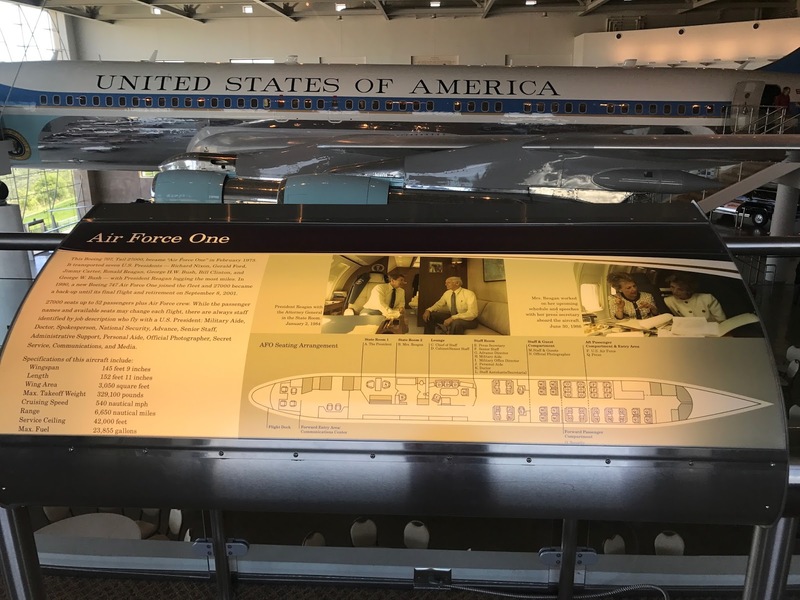 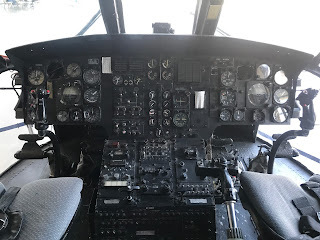 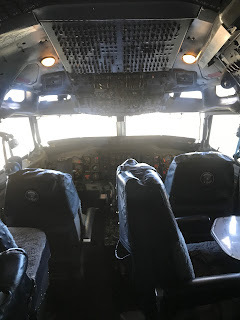 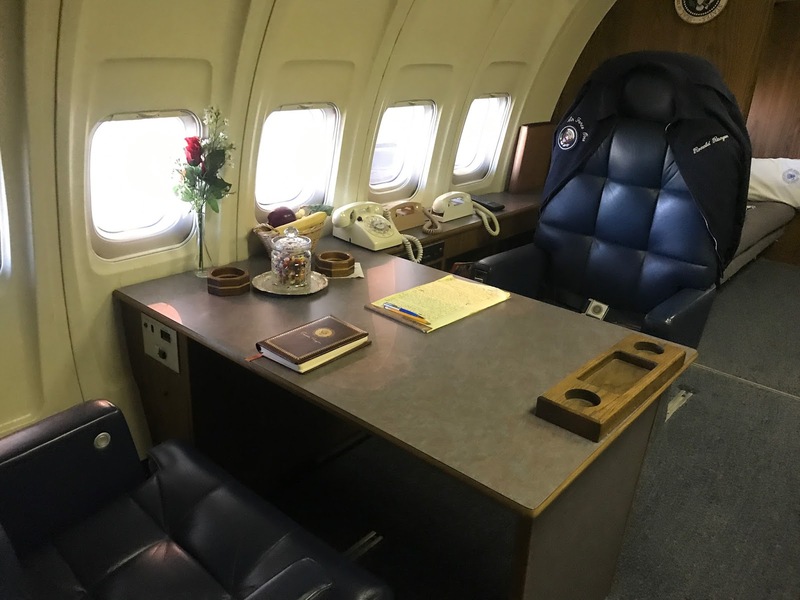 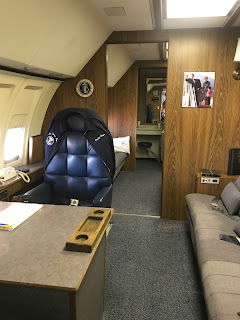 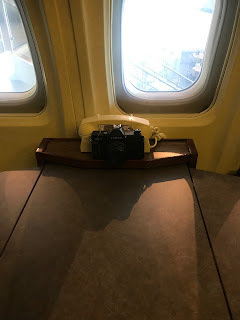 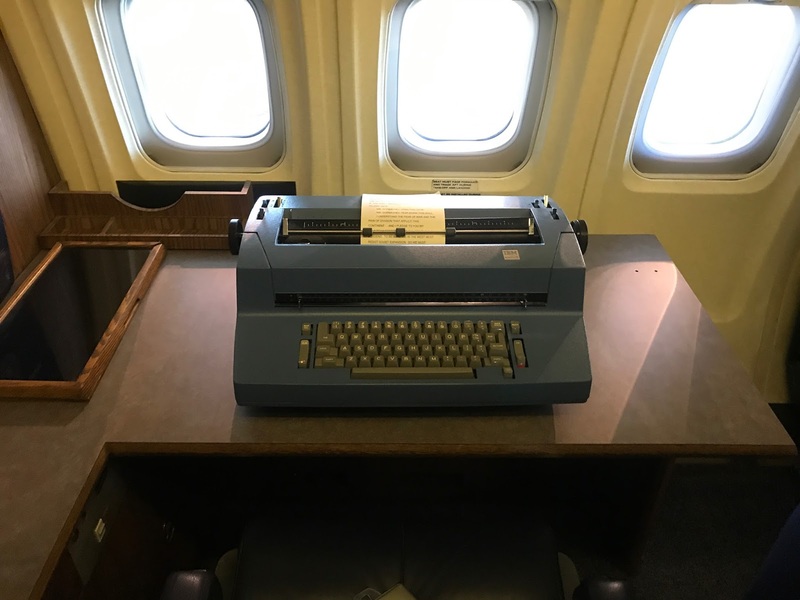 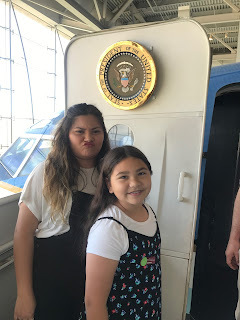 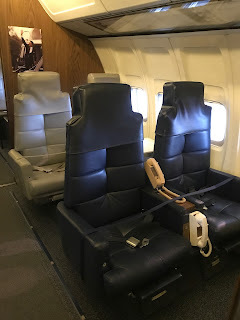 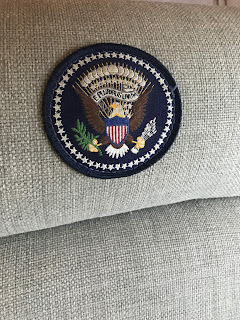 and then we headed off towards the other end of the library to see the coolest exhibit in the whole place - air force one. 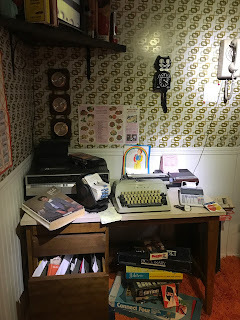 this was a fun maze that the bean and i worked on after her sister gave up. 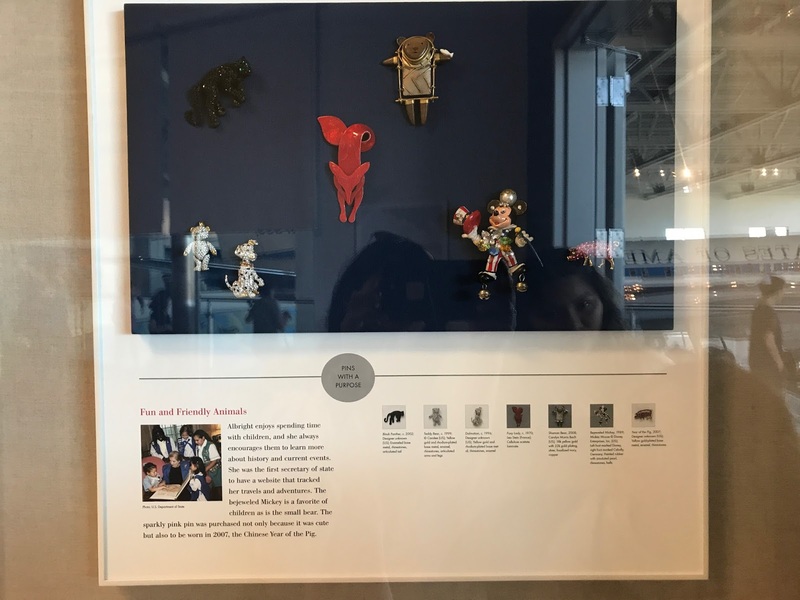 before making our way downstairs to walk through the plane, we stopped in to look at a collection of madeleine alright's pins and brooches. 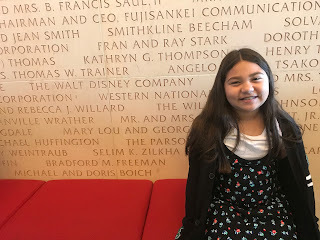 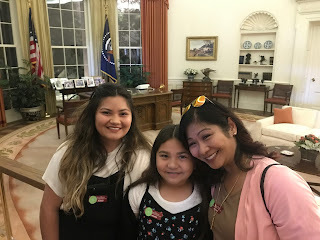 she always chose them carefully for whatever event she was attending, and it was really interesting to watch the video and hear her tell stories about the significance of each pin. 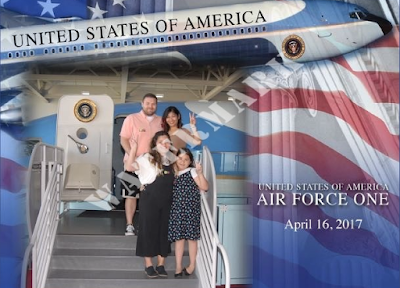 and we stopped for some cheesy photos because why not. 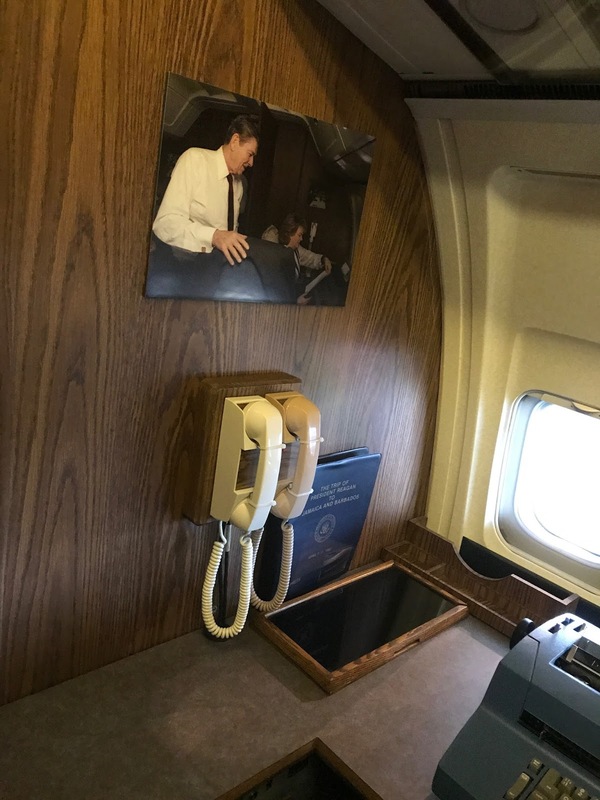 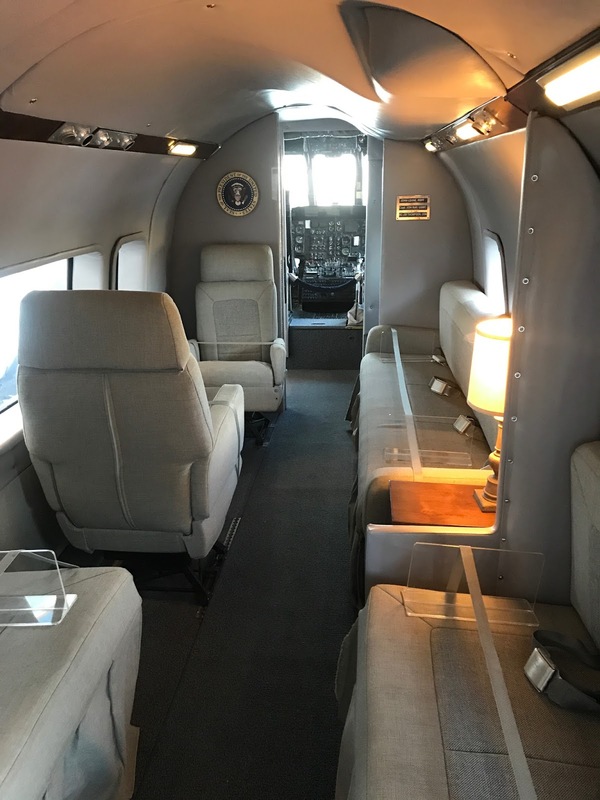 the plane was a lot smaller inside than i expected. 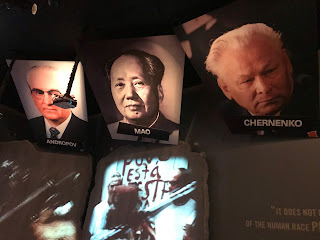 still really interesting though, and while i'd read that they hadn't allowed photos inside before, no one said anything as i snapped away. 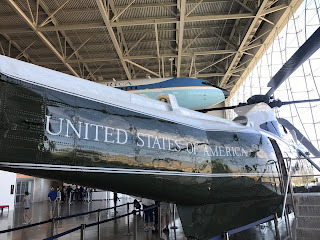 as we walked through, you could see the transition from where the president rode to areas for security, press and other guests were seated. 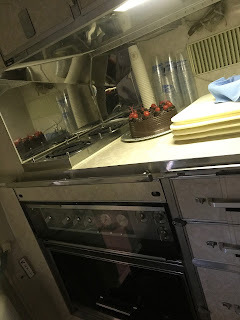 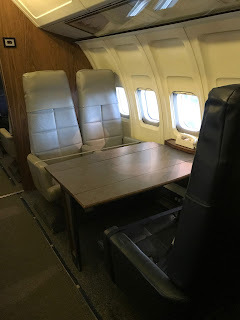 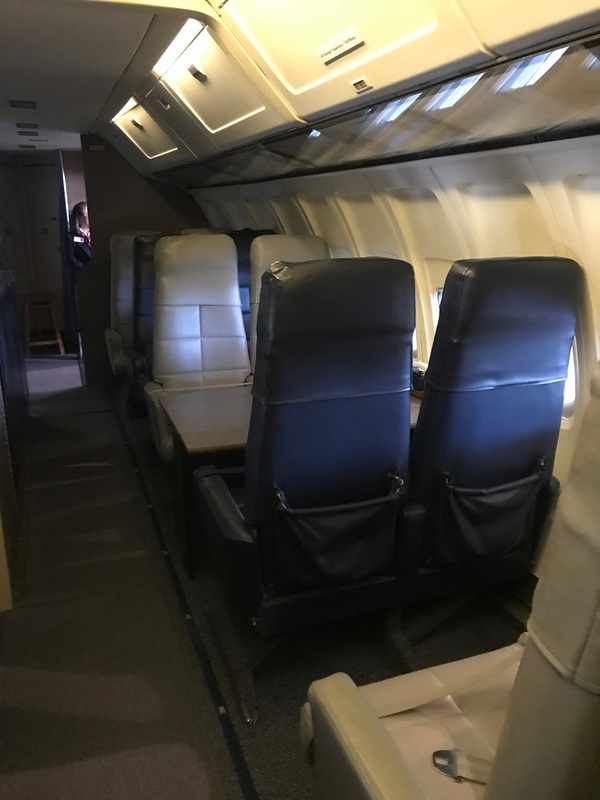 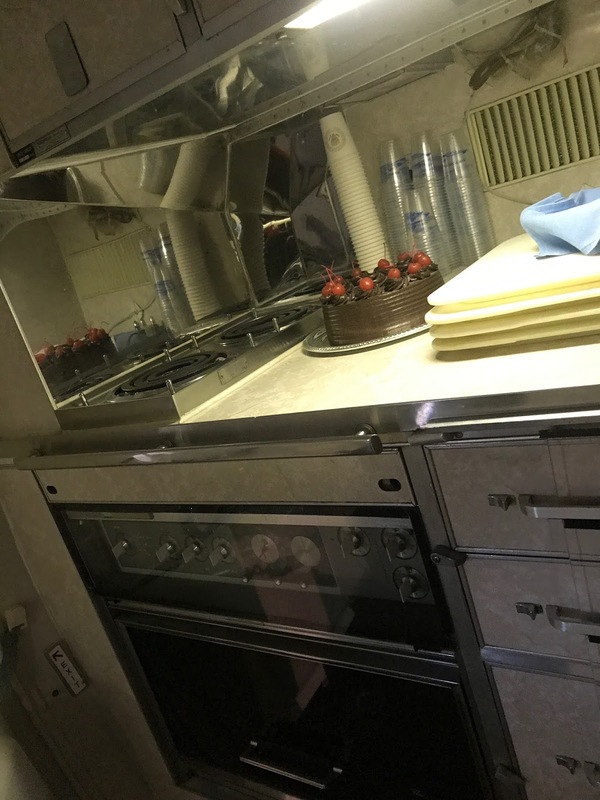 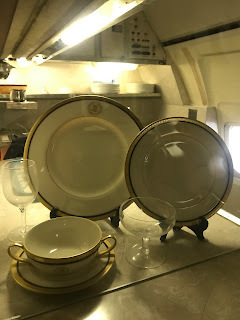 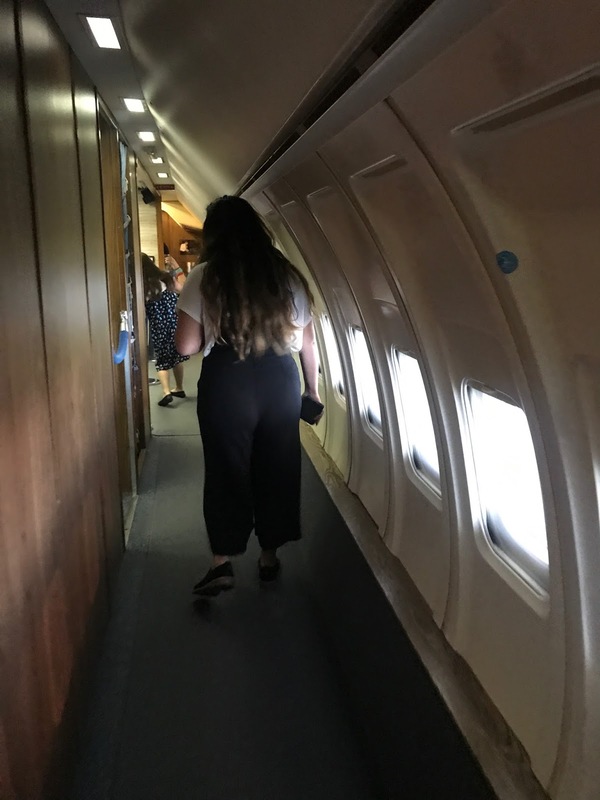 the galley was near the rear of the plane. 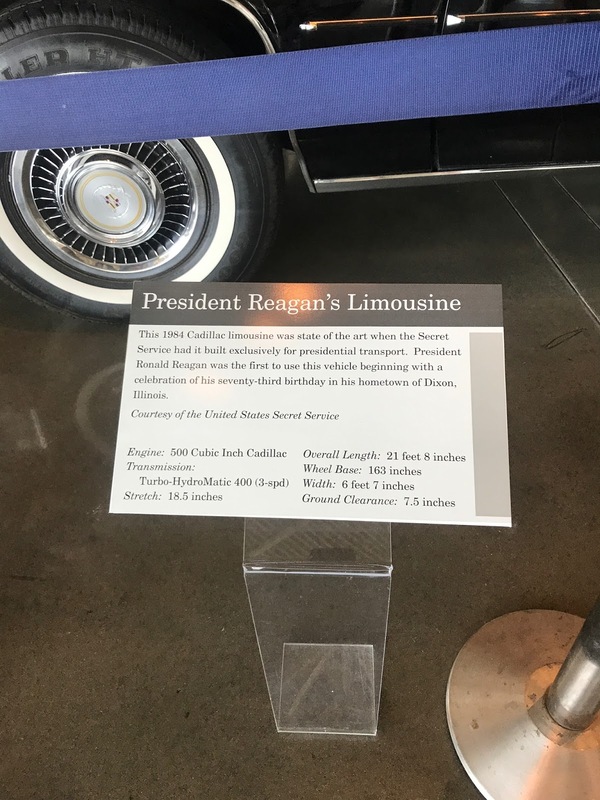 outside, there were vehicles that had been used in the presidential motorcade. 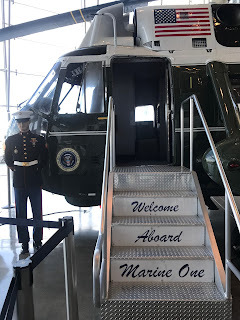 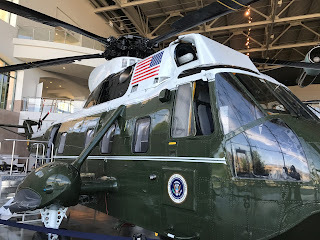 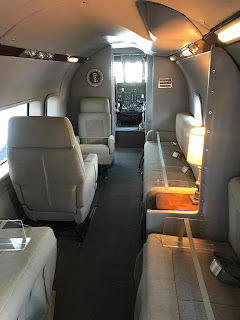 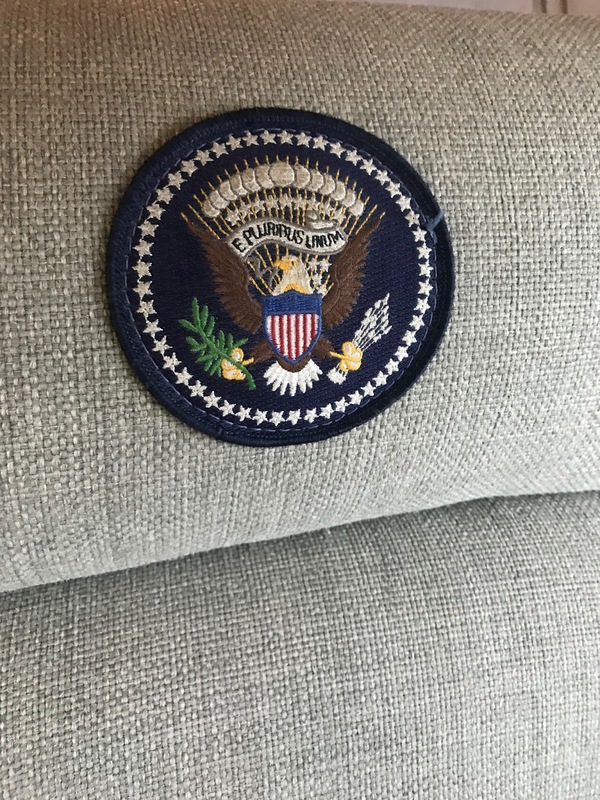 we also got to walk through marine one, the presidential helicopter. 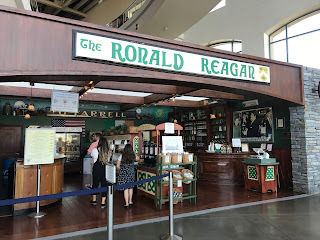 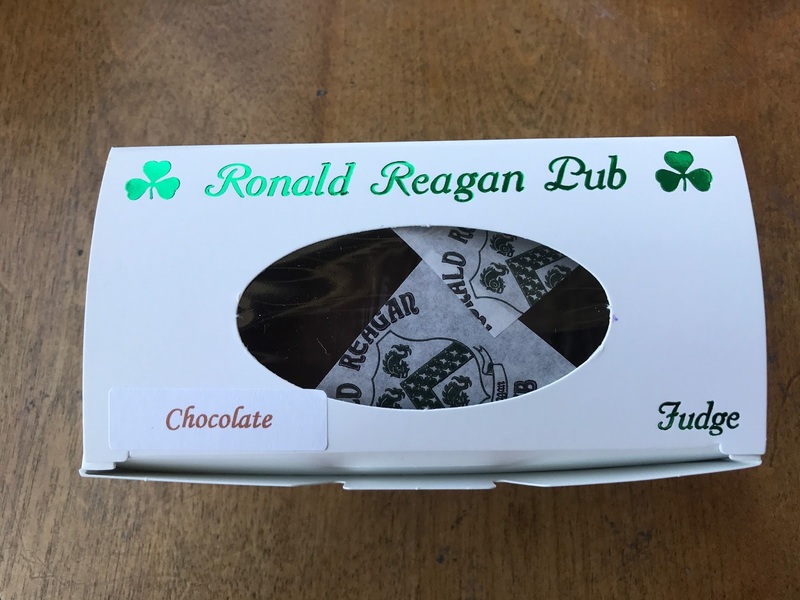 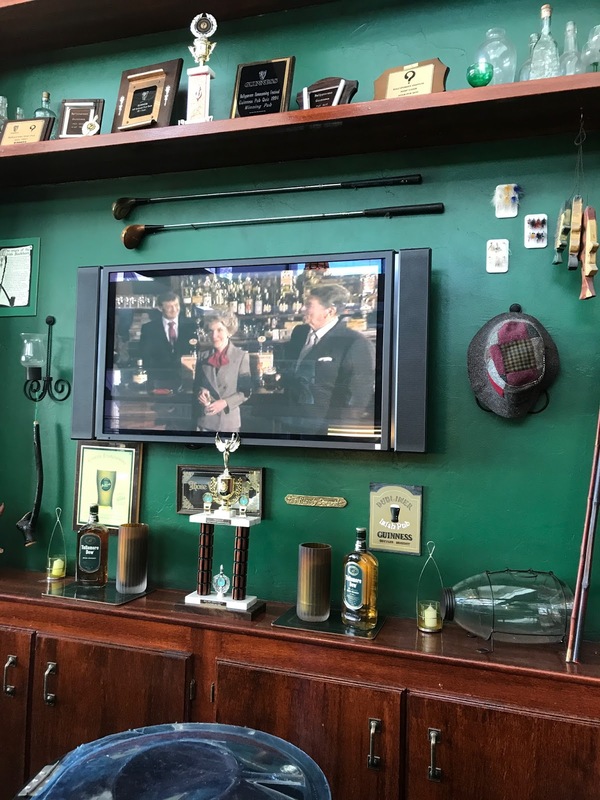 we stopped at the ronald reagan pub to grab something to eat before heading back inside to continue our tour. pretty basic stuff - grab & go salads, pizzas, sandwiches, chips, you get it. 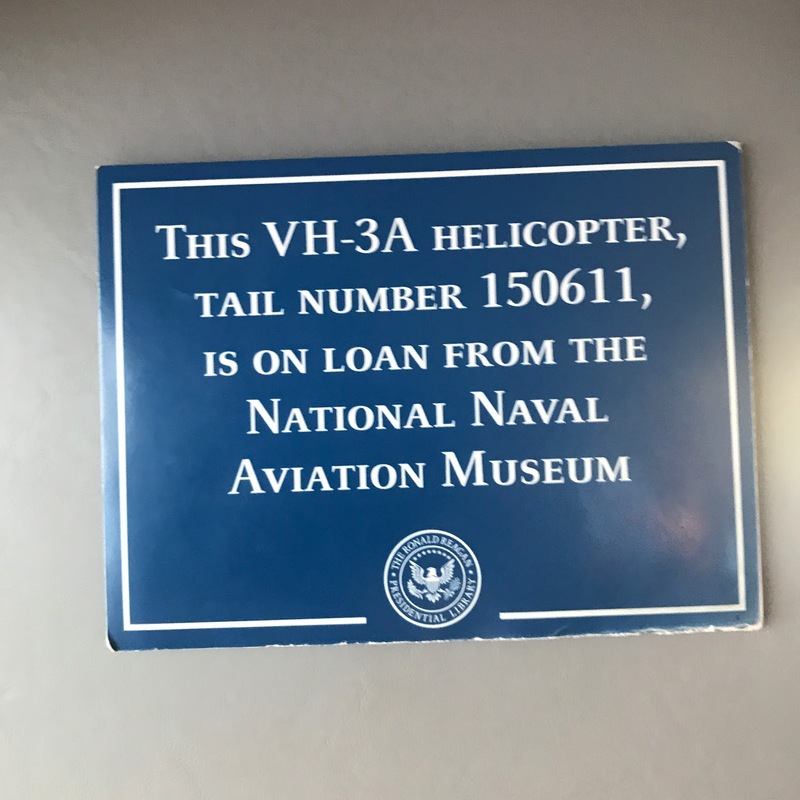 nothing special. 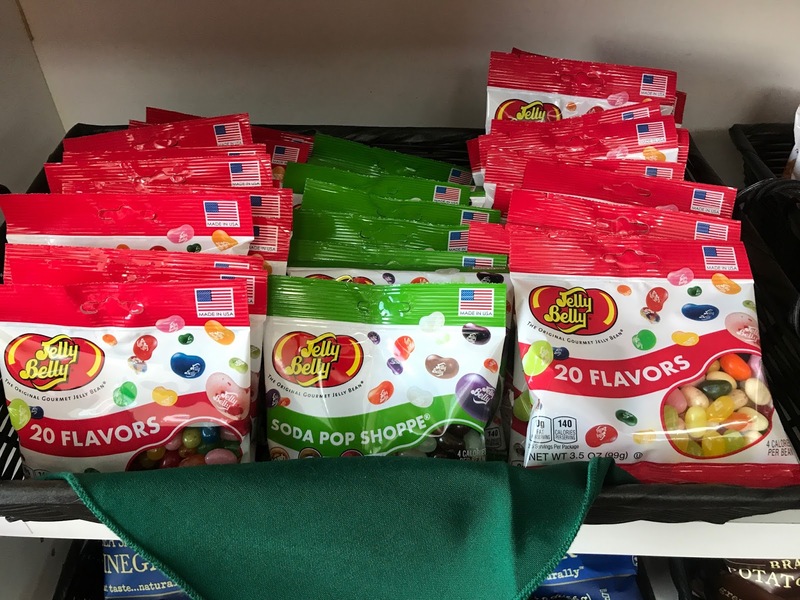 there were, of course, jelly beans for sale. 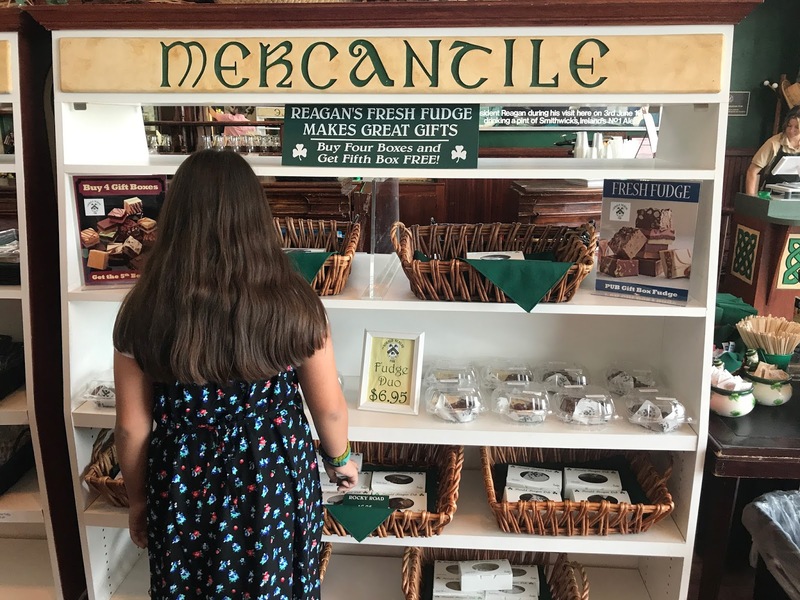 and fudge! 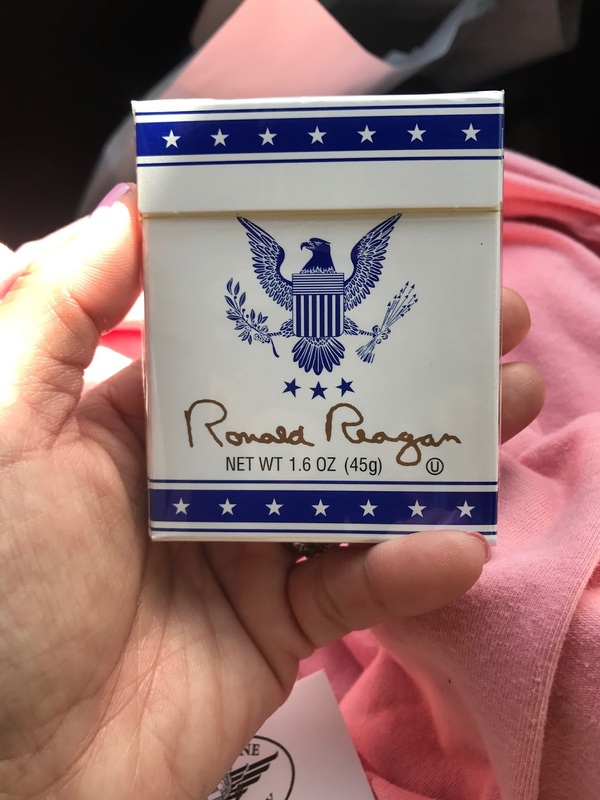 random, but we bought some anyway. 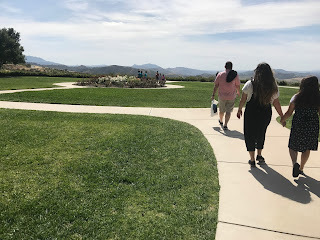 we went outside to gaze at the view and then headed back inside. 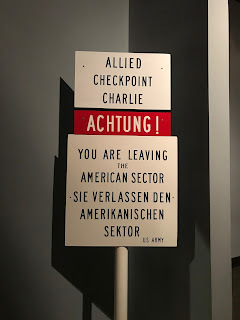 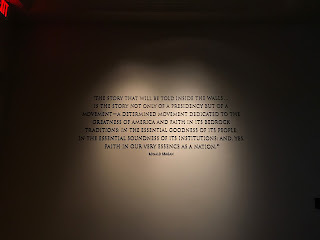 the rest of the galleries served as brief history lessons (or for me, reminders of things i'd grown up watching on tv). 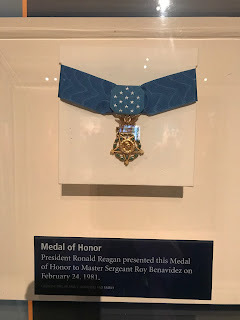 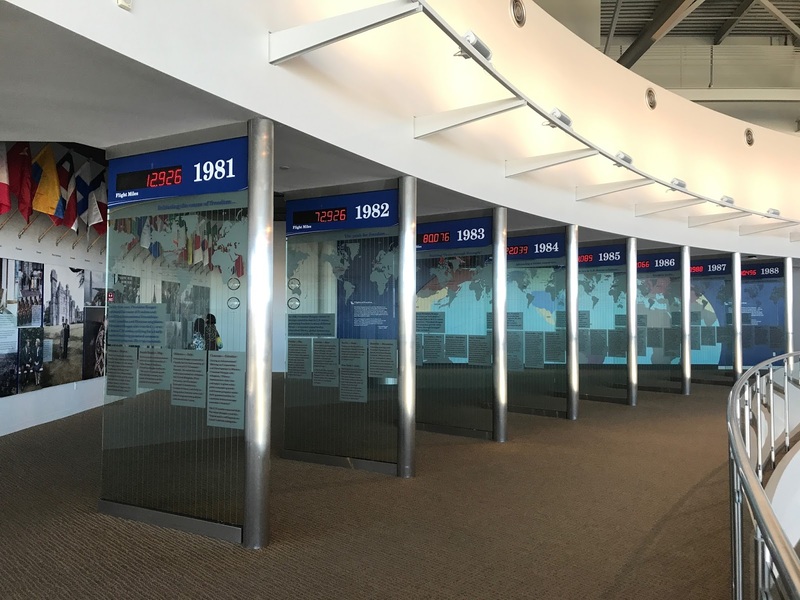 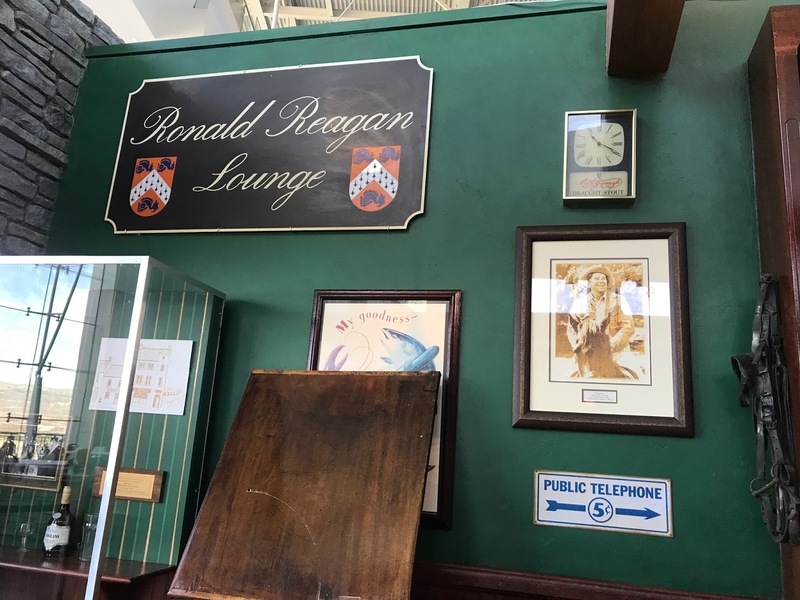 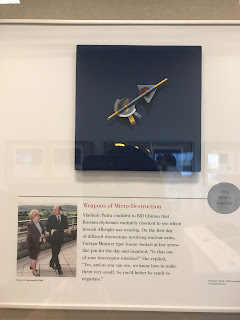 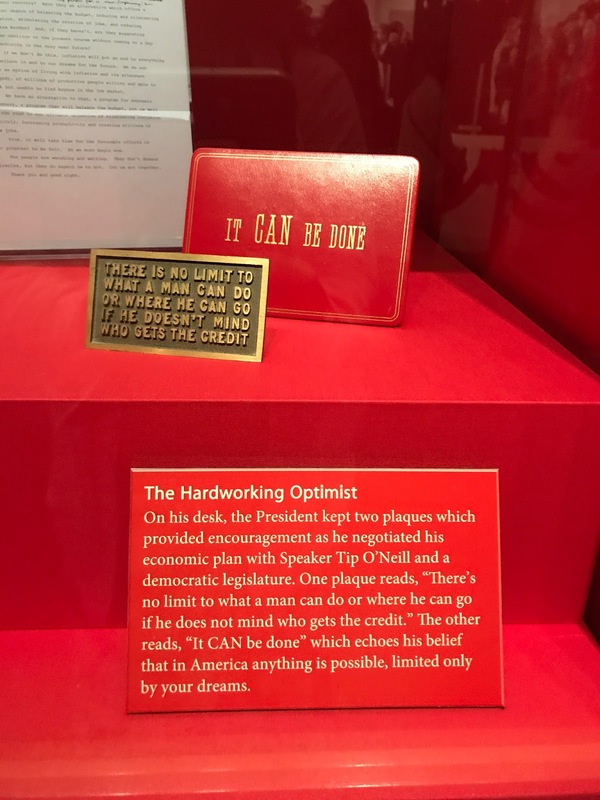 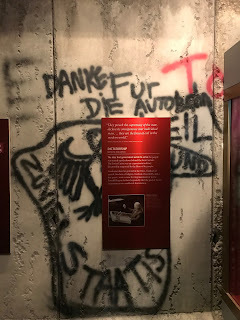 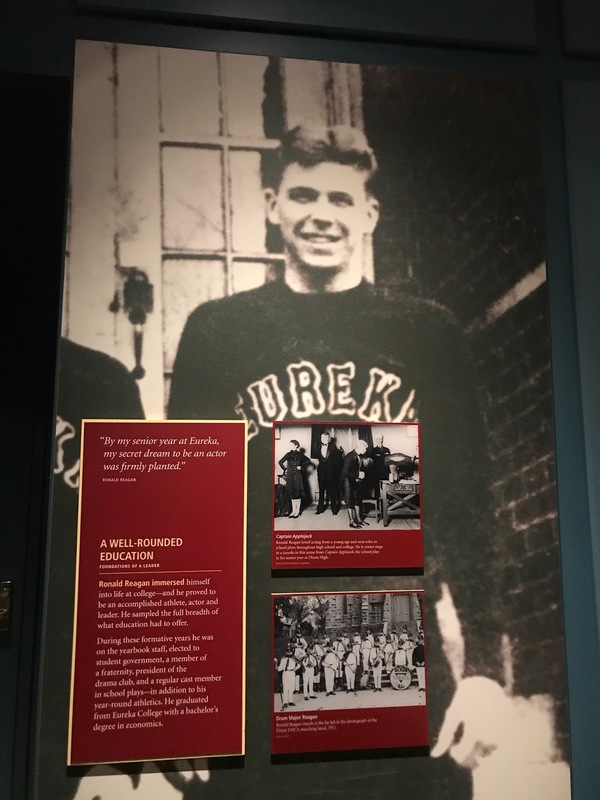 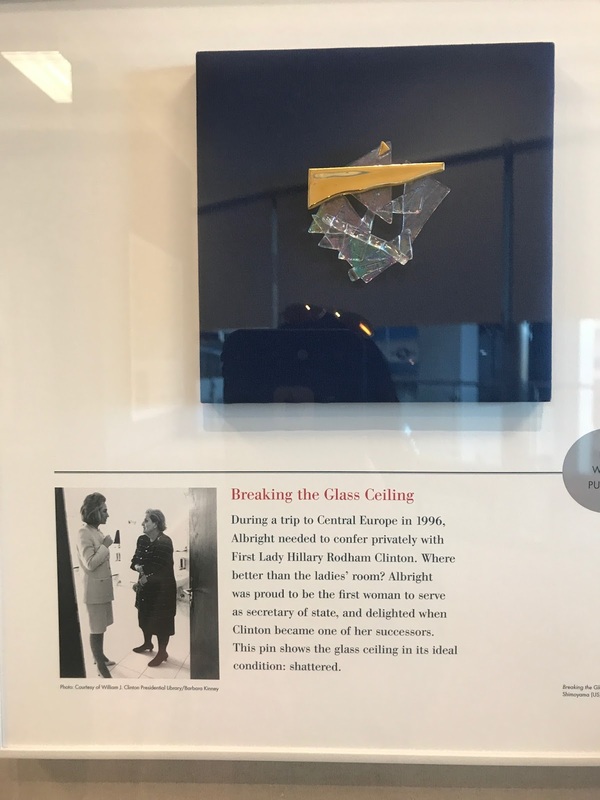 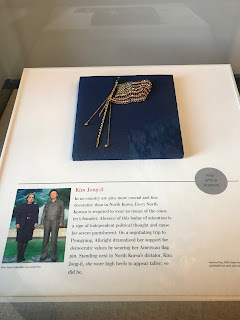 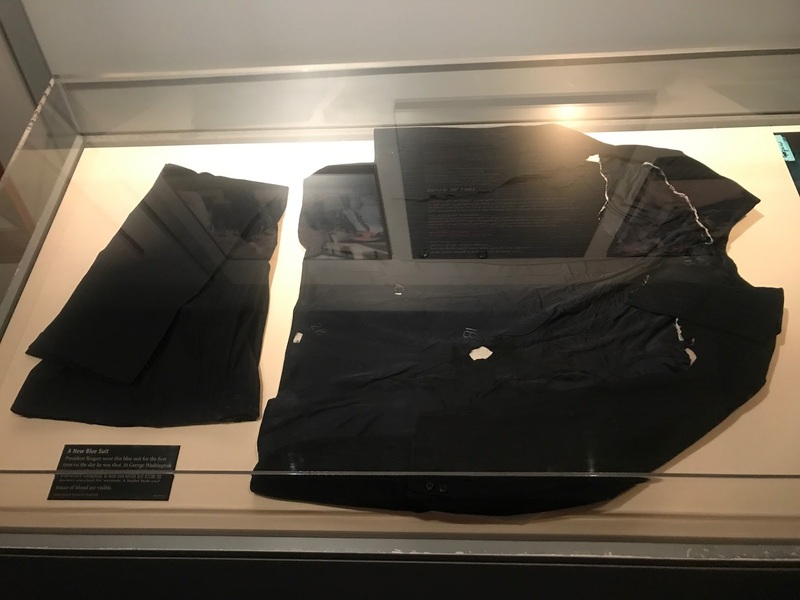 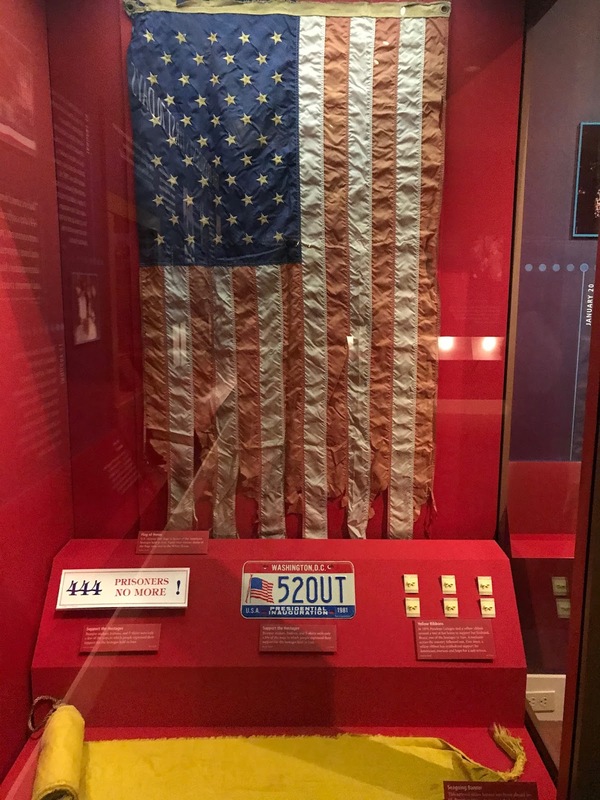 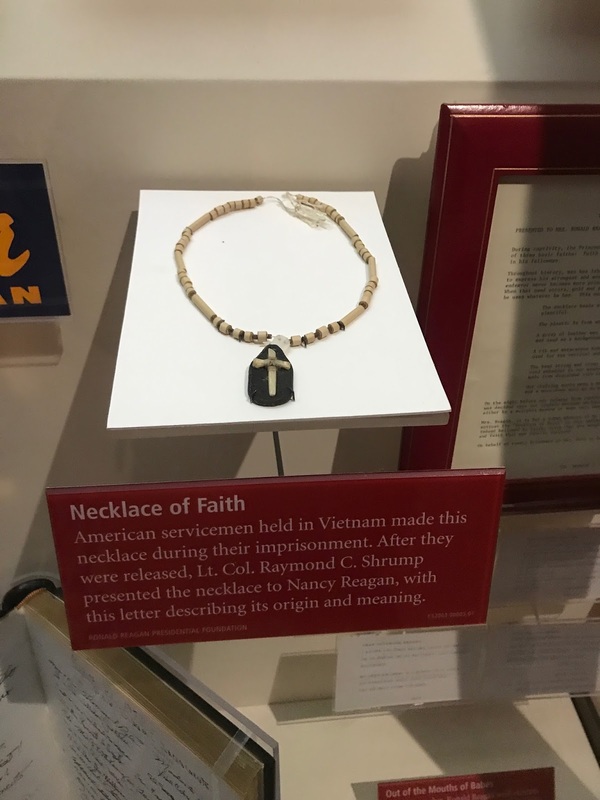 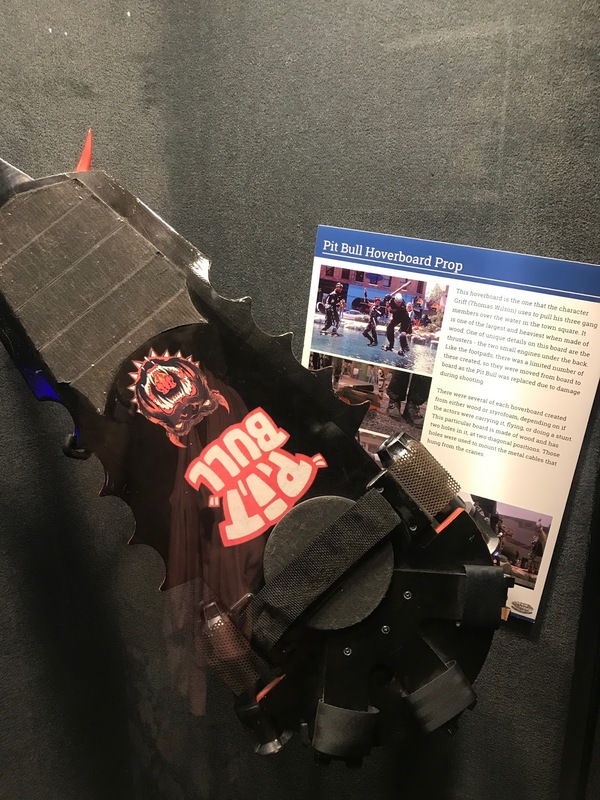 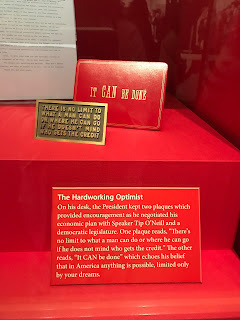 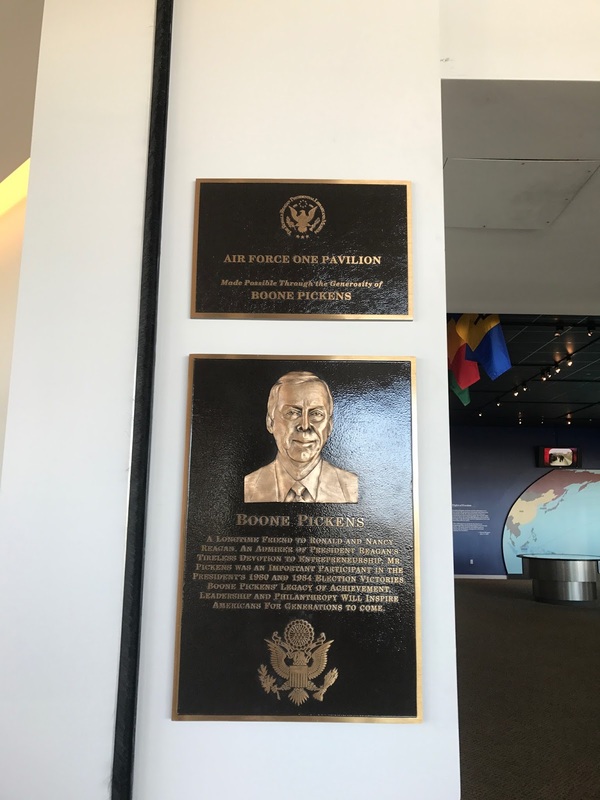 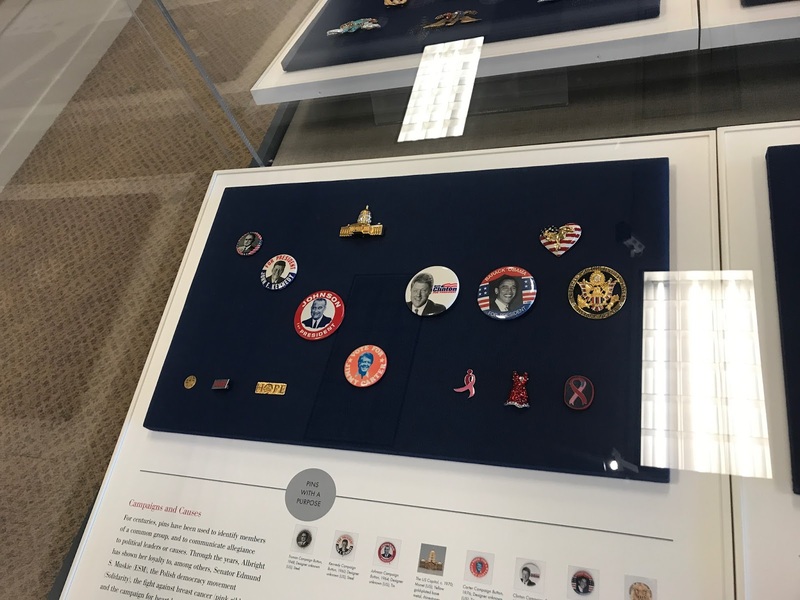 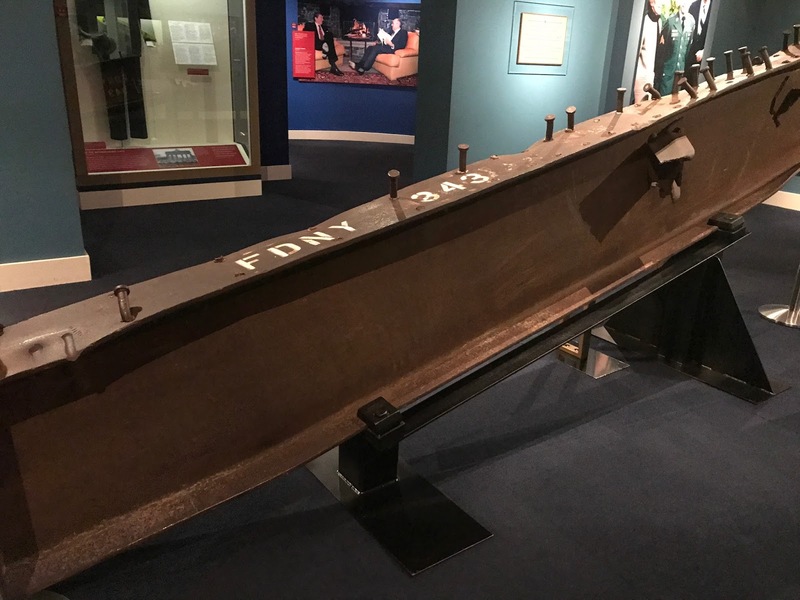 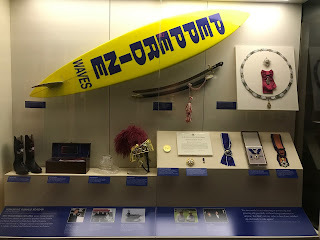 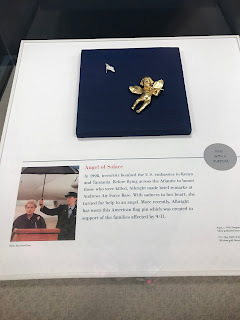 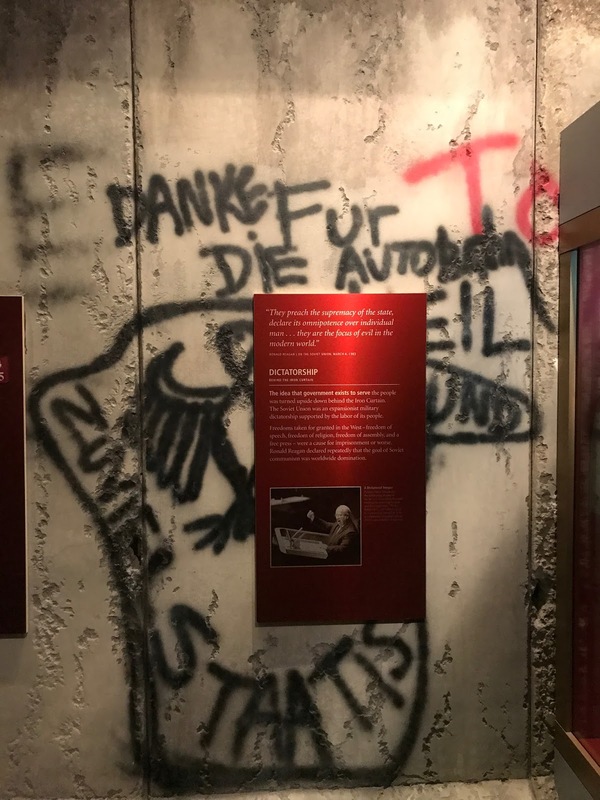 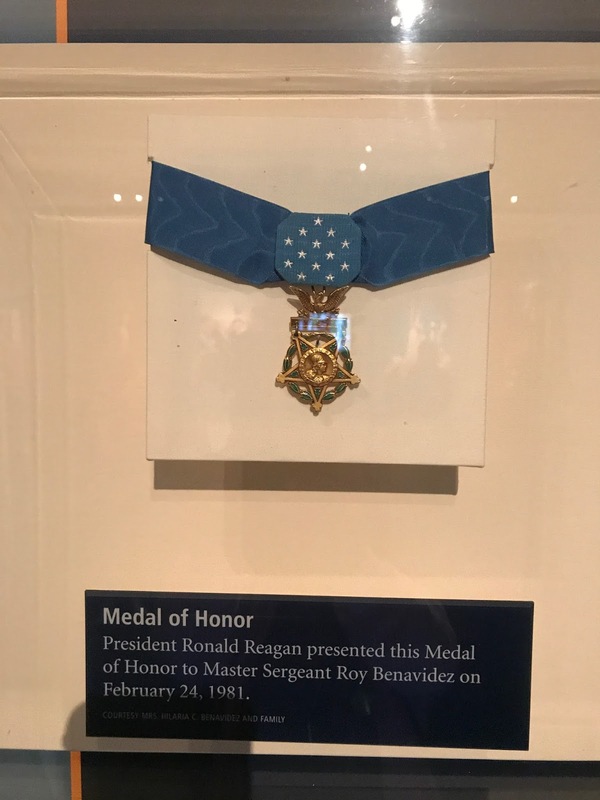 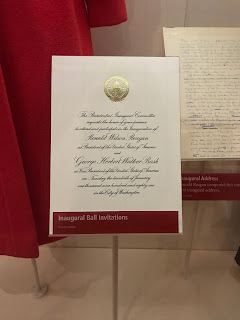 the memorabilia on display was pretty fascinating to look at, like medals of honor, a piece of a steel beam recovered from the 9-11 site, and various gifts that reagan received during his presidency. 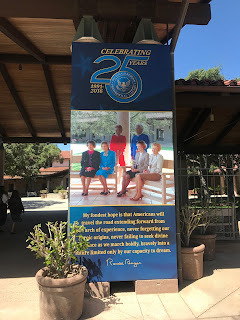 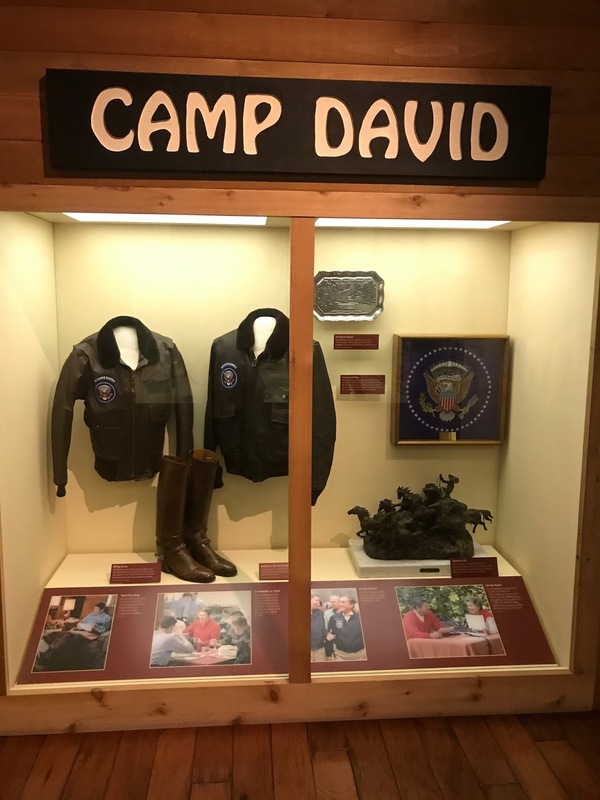 there was a fun exhibit that gave an overview of the reagans' life at their ranch in santa barbara and stays at camp david. 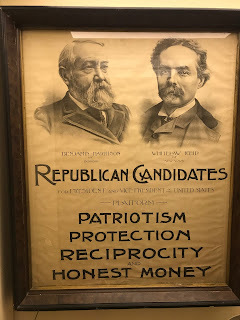 this campaign poster is the real deal...not a reproduction, and look at how old it is! 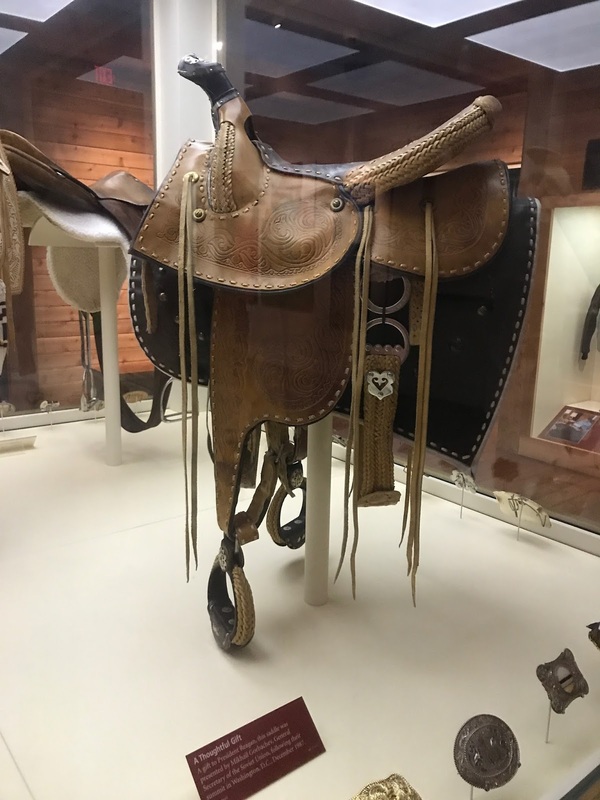 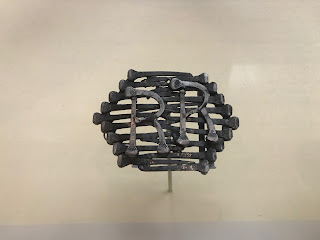 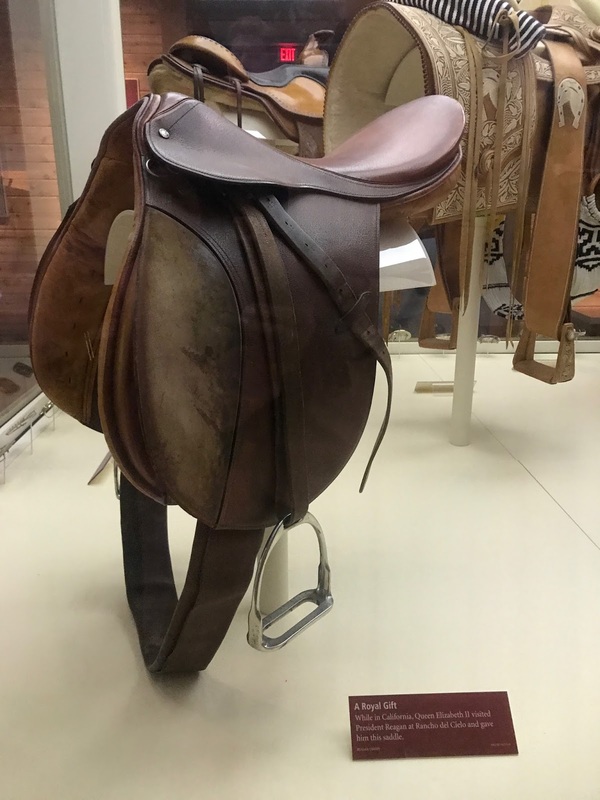 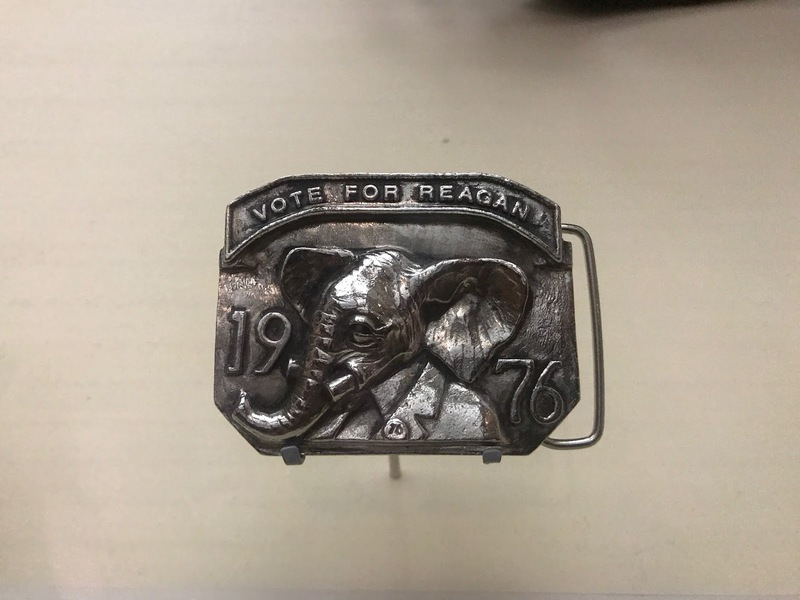 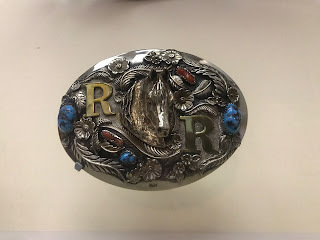 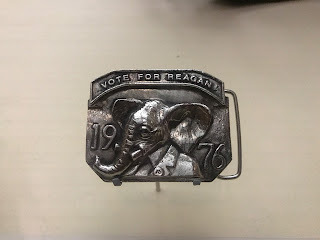 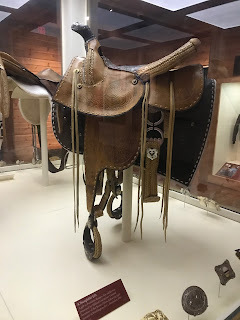 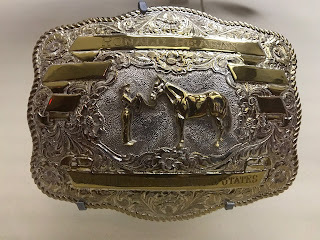 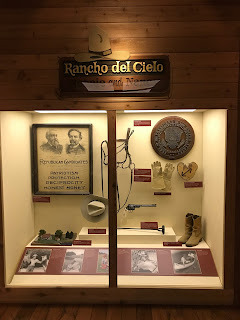 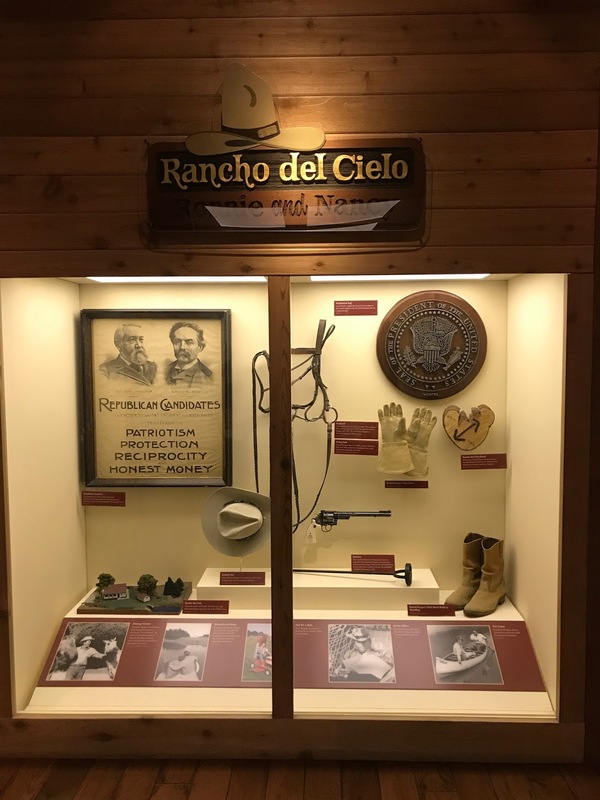 reagan received over 300 belt buckles as gifts, as well as saddles and other ranch paraphernalia. 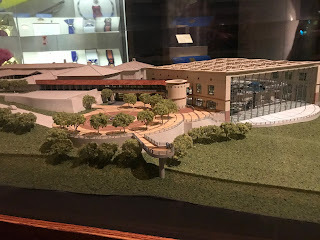 there was a model of the library on display. 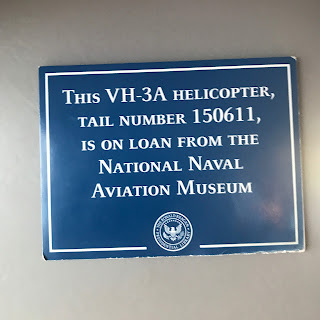 i love looking at stuff like this. 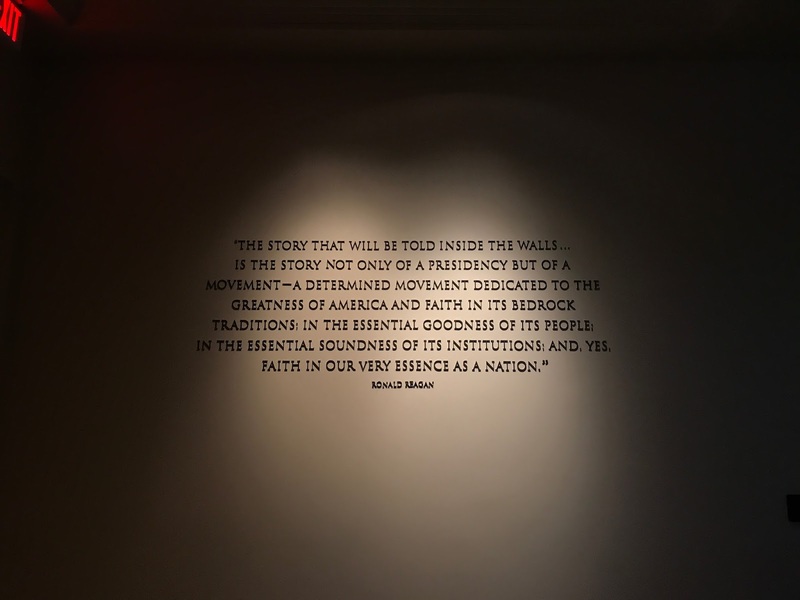 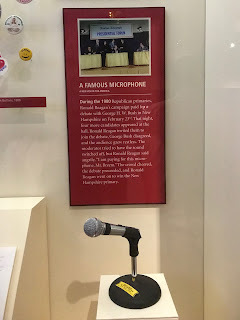 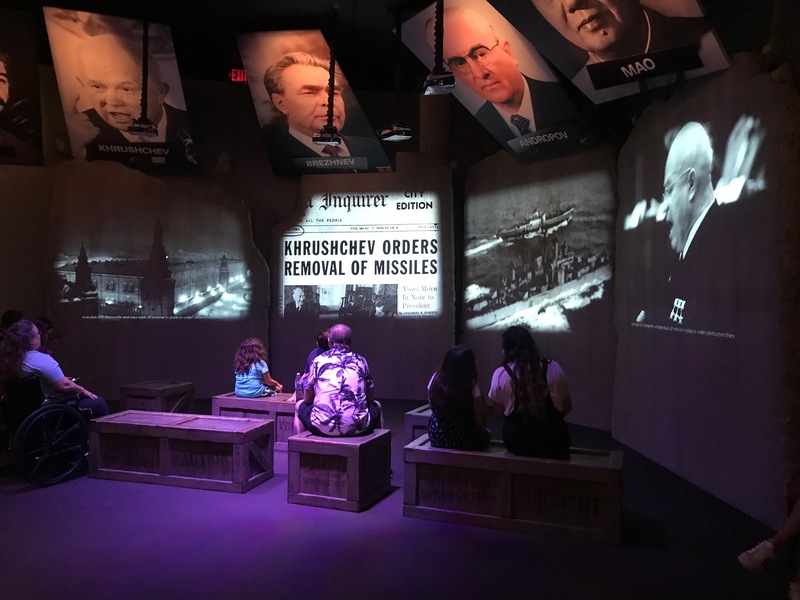 towards the end, the exhibits discussed reagan's post-presidency life. 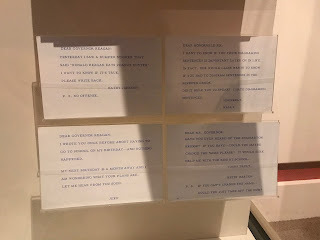 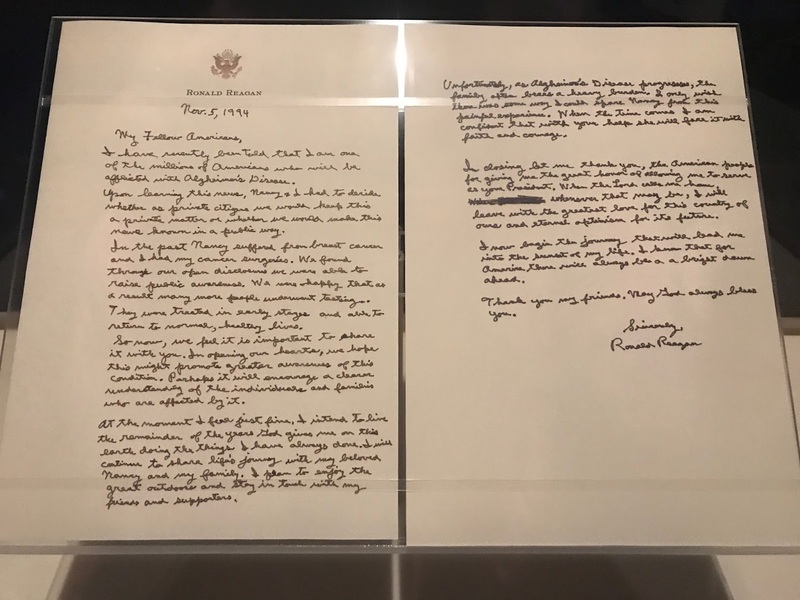 the letter he'd personally written to announce his diagnosis of alzheimer's disease to the public was on display. it got really sad after that, with footage from his memorial service and reactions from around the world as well as some heartbreaking photographs of nancy as she dealt with the loss of her husband. 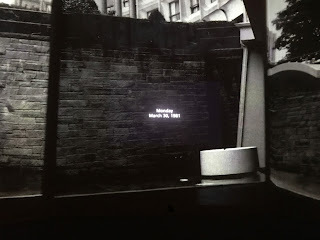 i still remembered watching it live and sobbing through the whole thing. 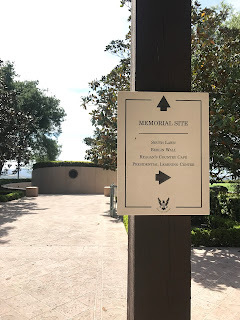 i didn't linger in that area for very long and headed for the door. 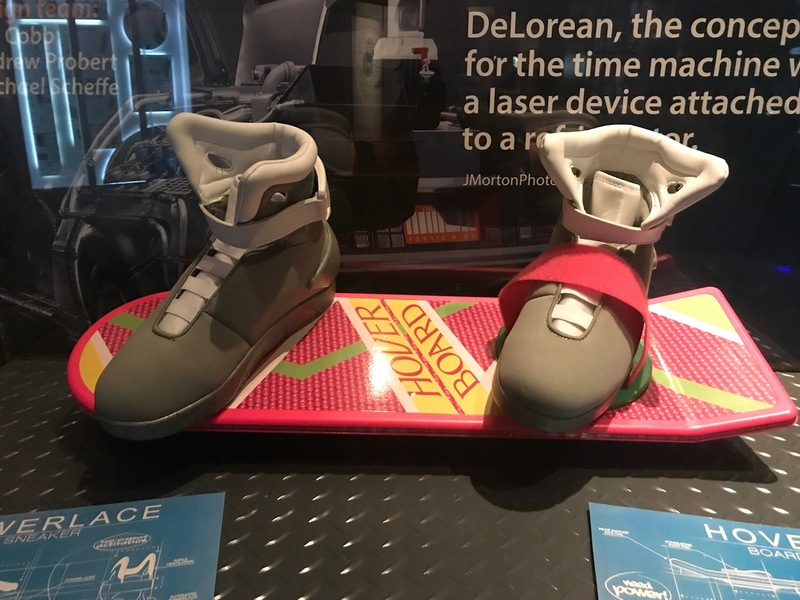 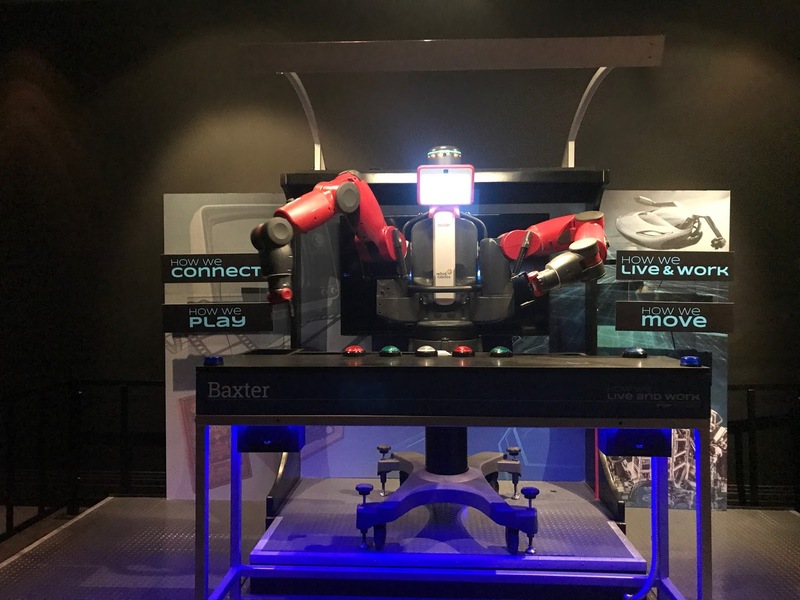 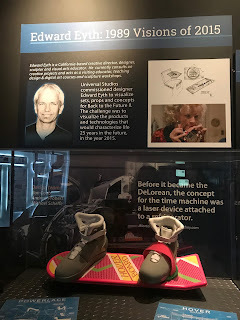 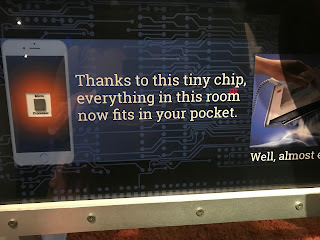 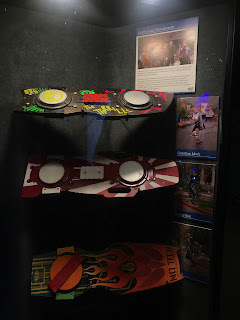 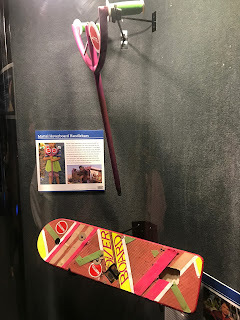 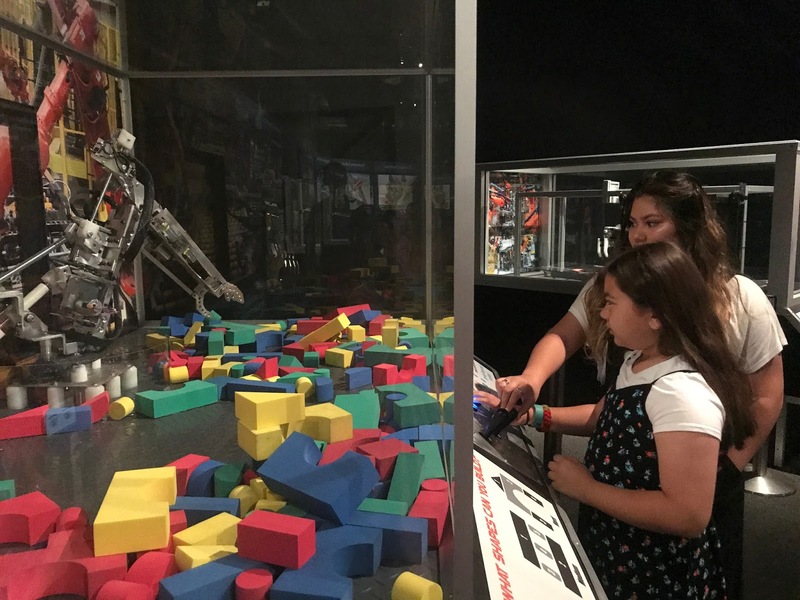 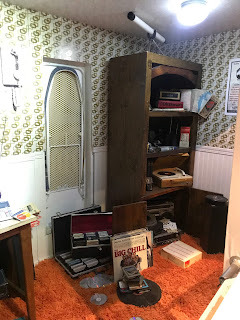 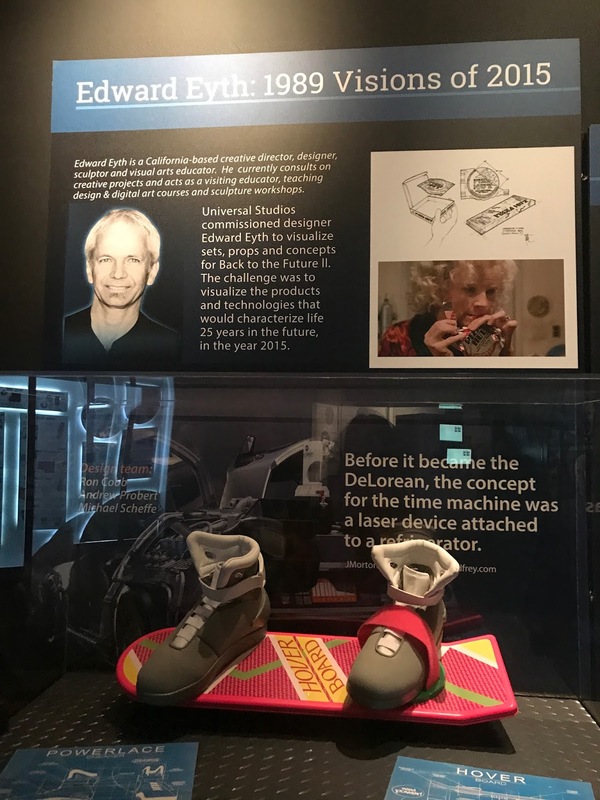 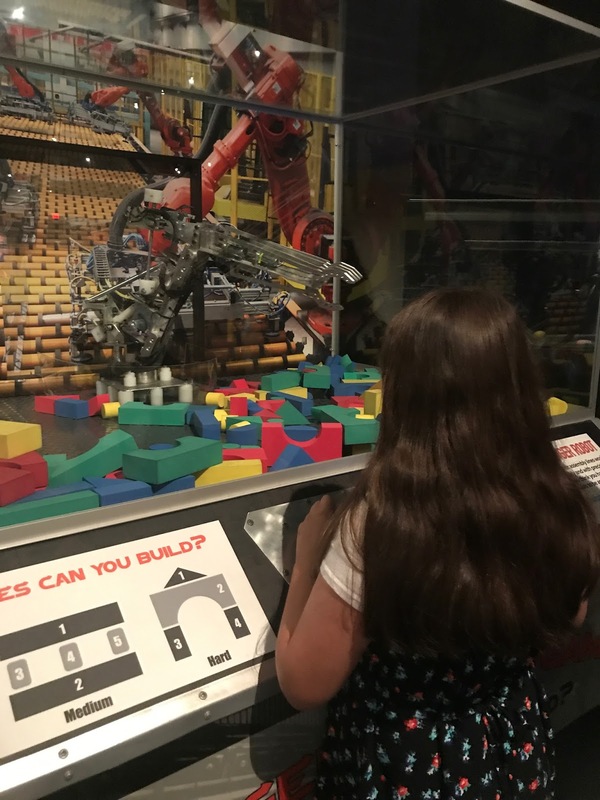 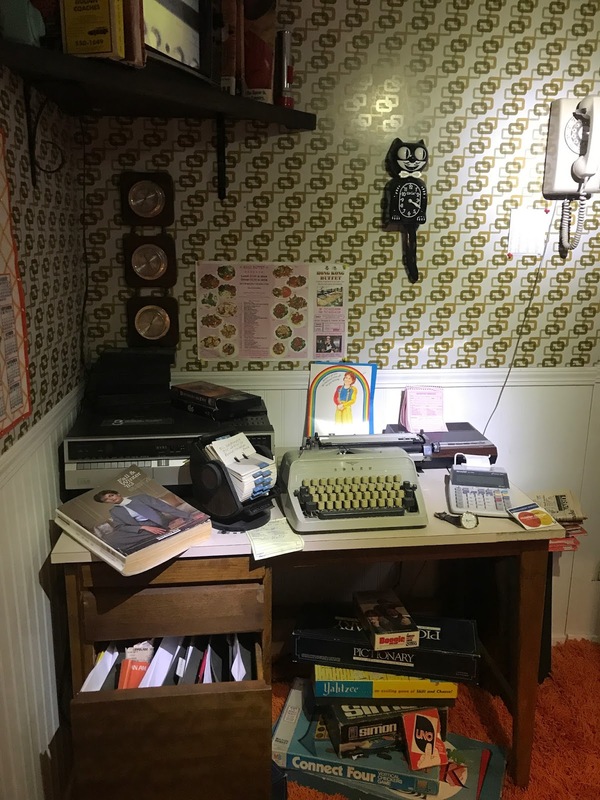 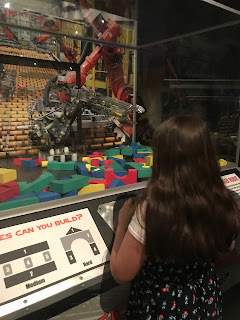 from there, we headed into another room to check out a fun-looking exhibit called "interactive" - examples of how technology and pop culture work together to make life easier. 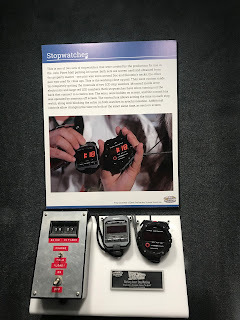 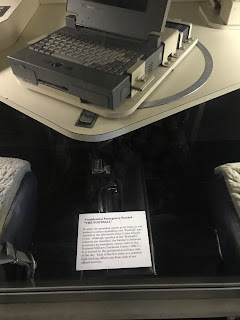 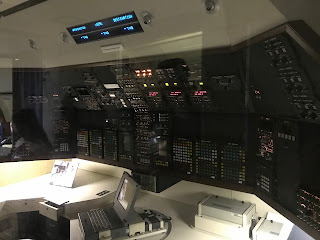 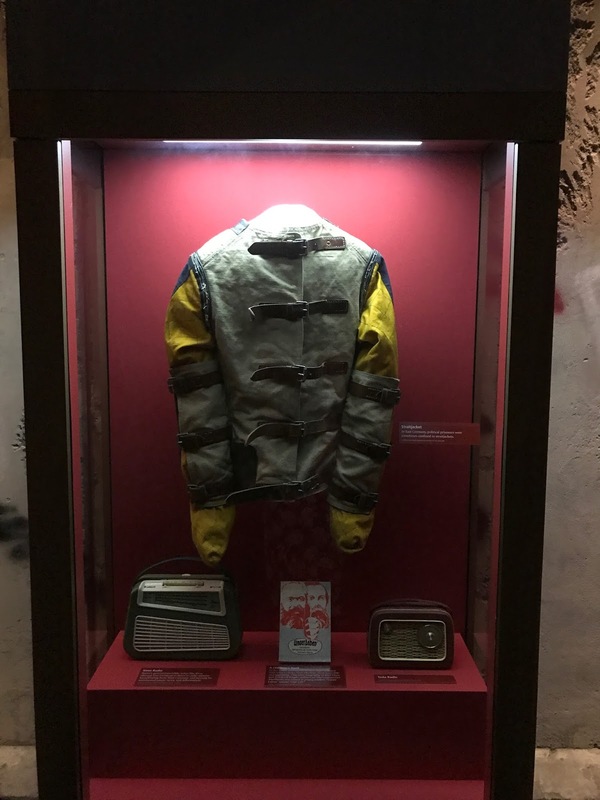 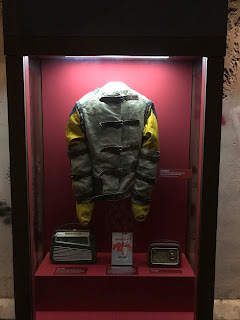 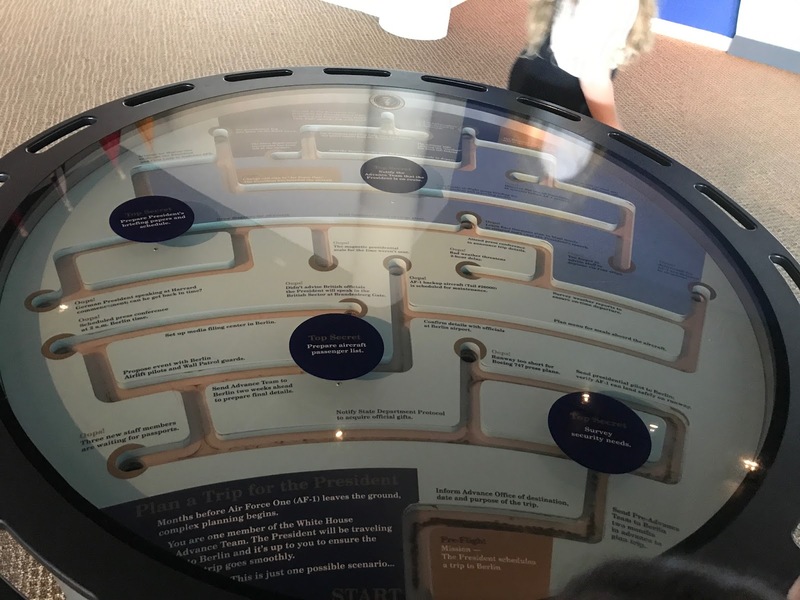 the functions of all of the equipment in this display can now be done using either a smartphone, a laptop or a desktop computer. the girls had some fun with the hands-on exhibits. 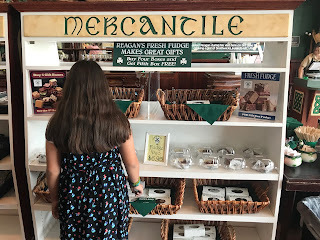 we hit up the gift shop on the way out to look at all the stuff for sale. 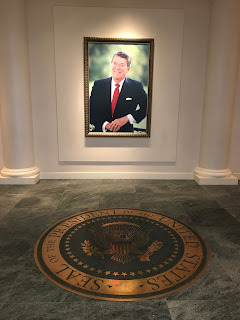 and paid our respects at the gravesite of both ronald and nancy. we'd actually upgraded our tickets to an annual pass, which gives us a year of access to the library and the rotating museum exhibits. 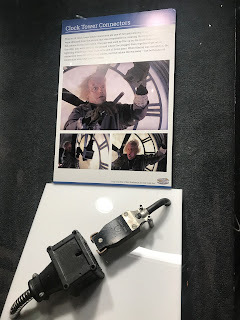 there's a titanic exhibit coming soon, which the old lady definitely wants to come back for. 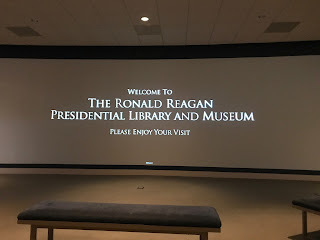 and it also gets us free admission to all of the other existing presidential libraries, should we find ourselves near any of them. most of them are on the east coast and midwest areas, so i doubt we'll get out to them, but hey - the nixon library isn't far from us. 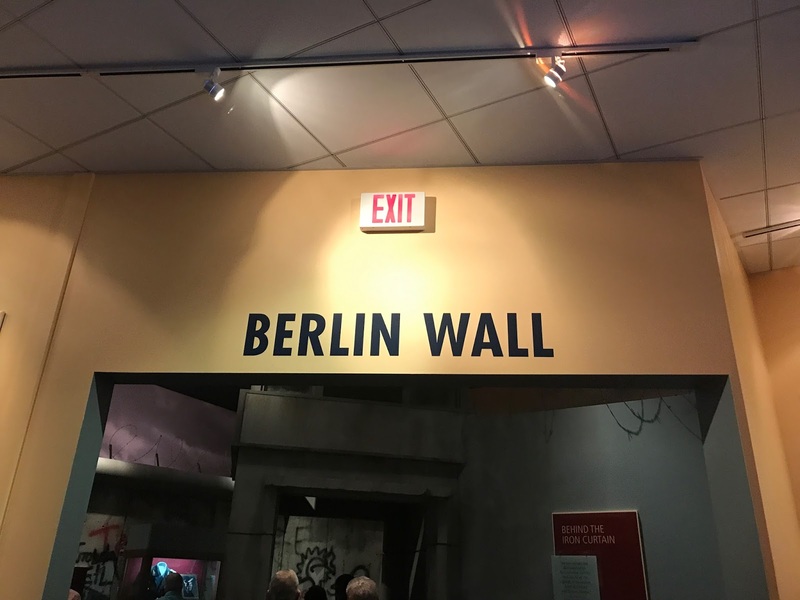 maybe we'll go check that one out one of these days. 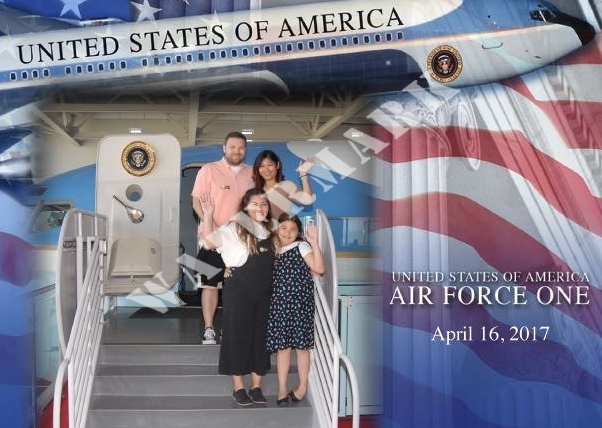 and that's how we spent our easter sunday!